Caching is a popular topic when we are building a high performance and high scalable system not only on top of the cloud platform but the on-premise environment as well. 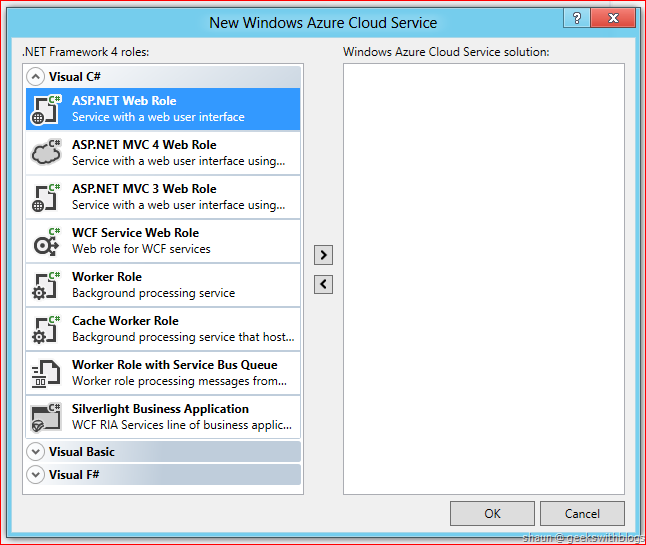 On March 2011 the Windows Azure AppFabric Caching had been production launched. It provides an in-memory, distributed caching service over the cloud. 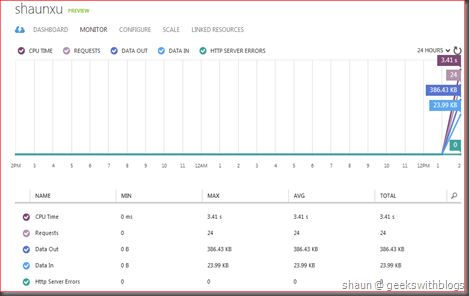 And now, in this June 2012 update, the cache team announce a grand new caching solution on Windows Azure, which is called Windows Azure Caching (Preview). 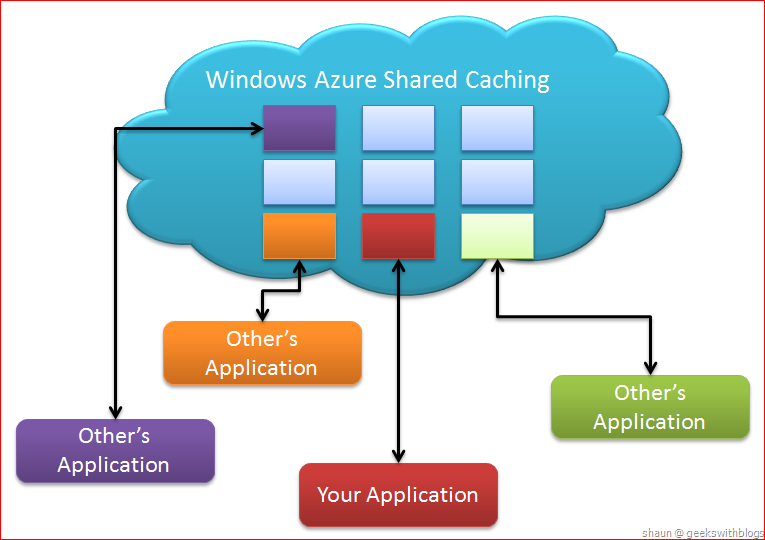 And the original Windows Azure AppFabric Caching was renamed to Windows Azure Shared Caching. 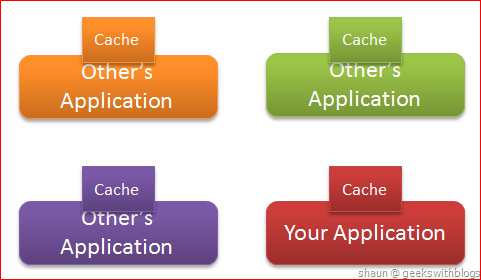 If you had been using the Shared Caching you should know that it is constructed by a bunch of cache servers. And when you want to use you should firstly create a cache account from the developer portal and specify the size you want to use, which means how much memory you can use to store your data that wanted to be cached. Then you can add, get and remove them through your code through the cache URL. 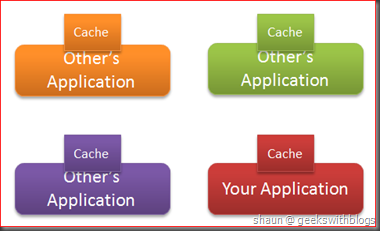 The Shared Caching is a multi-tenancy system which host all cached items across all users. So you don’t know which server your data was located. This caching mode works well and can take most of the cases. But it has some problems. The first one is the performance. Since the Shared Caching is a multi-tenancy system, which means all cache operations should go through the Shared Caching gateway and then routed to the server which have the data your are looking for. Even though there are some caches in the Shared Caching system it also takes time from your cloud services to the cache service. Secondary, the Shared Caching service works as a block box to the developer. The only thing we know is my cache endpoint, and that’s all. Someone may satisfied since they don’t want to care about anything underlying. But if you need to know more and want more control that’s impossible in the Shared Caching. The last problem would be the price and cost-efficiency. You pay the bill based on how much cache you requested per month. But when we host a web role or worker role, it seldom consumes all of the memory and CPU in the virtual machine (service instance). If using Shared Caching we have to pay for the cache service while waste of some of our memory and CPU locally. Since the issues above Microsoft offered a new caching mode over to us, which is the Caching (Preview). Instead of having a separated cache service, the Caching (Preview) leverage the memory and CPU in our cloud services (web role and worker role) as the cache clusters. 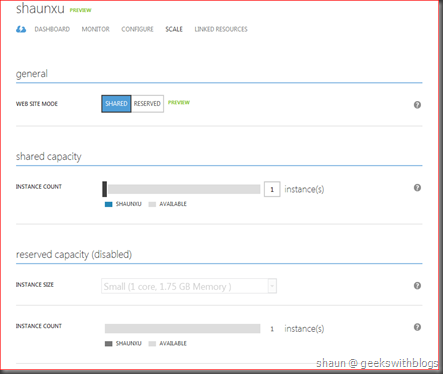 Hence the Caching (Preview) runs on the virtual machines which hosted or near our cloud applications. Without any gateway and routing, since it located in the same data center and same racks, it provides really high performance than the Shared Caching. 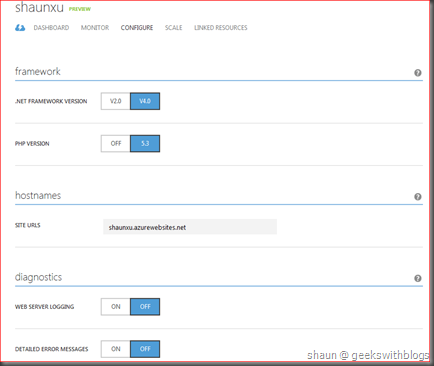 The Caching (Preview) works side-by-side to our application, initialized and worked as a Windows Service running in the virtual machines invoked by the startup tasks from our roles, we could get more information and control to them. And since the Caching (Preview) utilizes the memory and CPU from our existing cloud services, so it’s free. What we need to pay is the original computing price. And the resource on each machines could be used more efficiently. It’s very simple to enable the Caching (Preview) in a cloud service. Let’s create a new windows azure cloud project from Visual Studio and added an ASP.NET Web Role. Then open the role setting and select the Caching page. This is where we enable and configure the Caching (Preview) on a role. 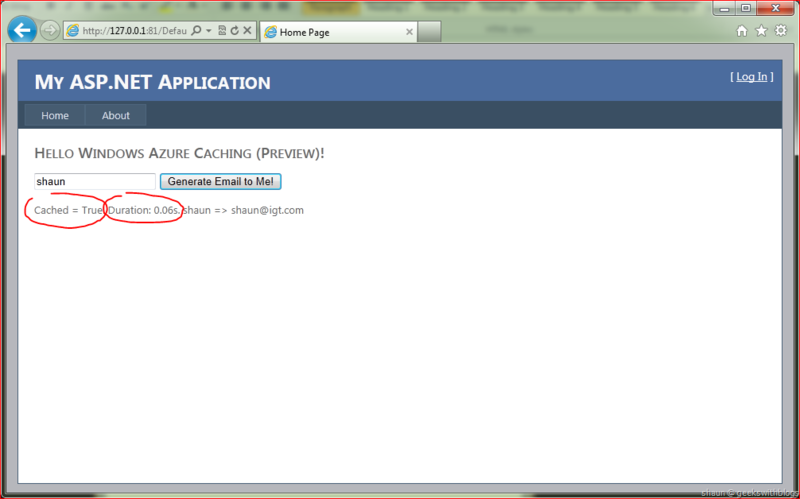 To enable the Caching (Preview) just open the “Enable Caching (Preview Release)” check box. And then we need to specify which mode of the caching clusters we want to use. There are two kinds of caching mode, co-located and dedicate. 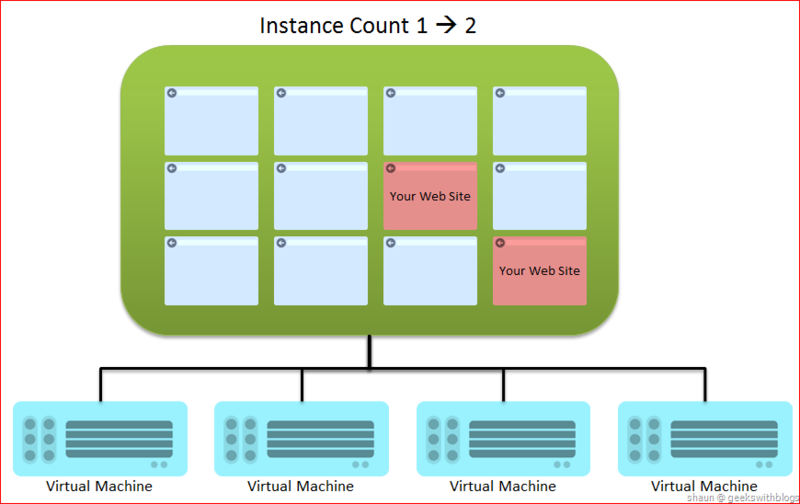 The co-located mode means we use the memory in the instances we run our cloud services (web role or worker role). By using this mode we must specify how many percentage of the memory will be used as the cache. The default value is 30%. So make sure it will not affect the role business execution. The dedicate mode will use all memory in the virtual machine as the cache. 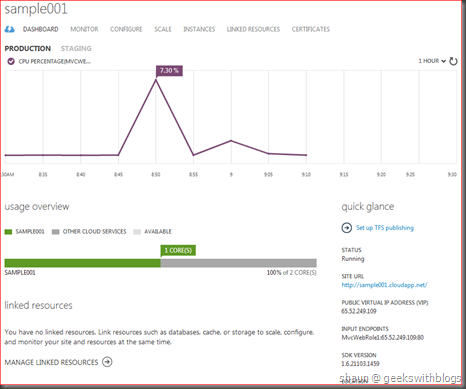 In fact it will reserve some for operation system, azure hosting etc.. But it will try to use as much as the available memory to be the cache. As you can see, the Caching (Preview) was defined based on roles, which means all instances of this role will apply the same setting and play as a whole cache pool, and you can consume it by specifying the name of the role, which I will demonstrate later. 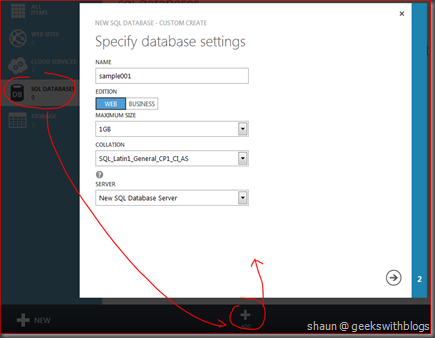 And in a windows azure project we can have more than one role have the Caching (Preview) enabled. Then we will have more caches. For example, let’s say I have a web role and worker role. The web role I specified 30% co-located caching and the worker role I specified dedicated caching. If I have 3 instances of my web role and 2 instances of my worker role, then I will have two caches. As the figure above, cache 1 was contributed by three web role instances while cache 2 was contributed by 2 worker role instances. Then we can add items into cache 1 and retrieve it from web role code and worker role code. 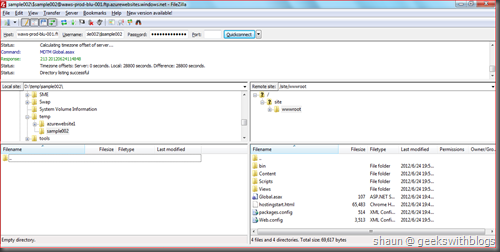 But the items stored in cache 1 cannot be retrieved from cache 2 since they are isolated. 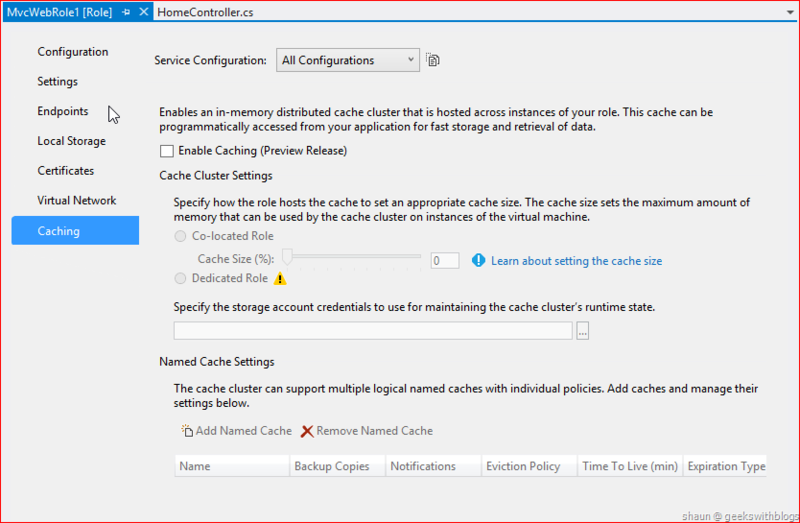 Back to our Visual Studio we specify 30% of co-located cache and use the local storage emulator to store the cache cluster runtime status. Then at the bottom we can specify the named caches. Now we just use the default one. 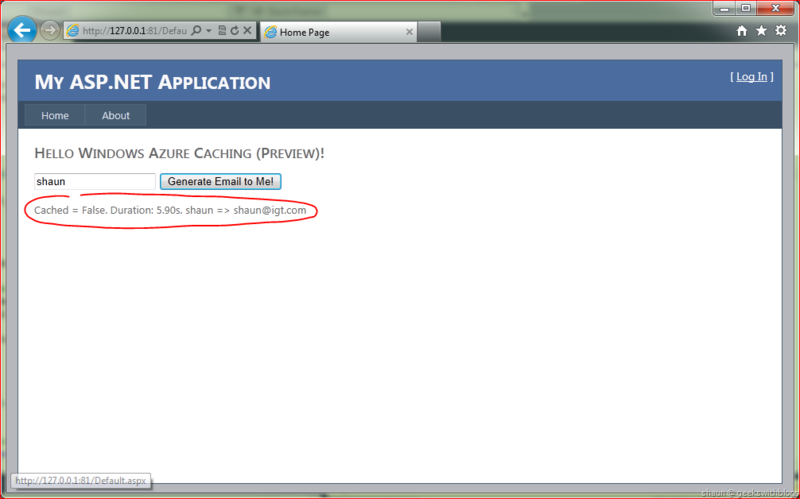 Now we had enabled the Caching (Preview) in our web role settings. Next, let’s have a look on how to consume our cache. The Caching (Preview) can only be consumed by the roles in the same cloud services. As I mentioned earlier, a cache contributed by web role can be connected from a worker role if they are in the same cloud service. But you cannot consume a Caching (Preview) from other cloud services. This is different from the Shared Caching. The Shared Caching is opened to all services if it has the connection URL and authentication token. To consume the Caching (Preview) we need to add some references into our project as well as some configuration in the Web.config. NuGet makes our life easy. 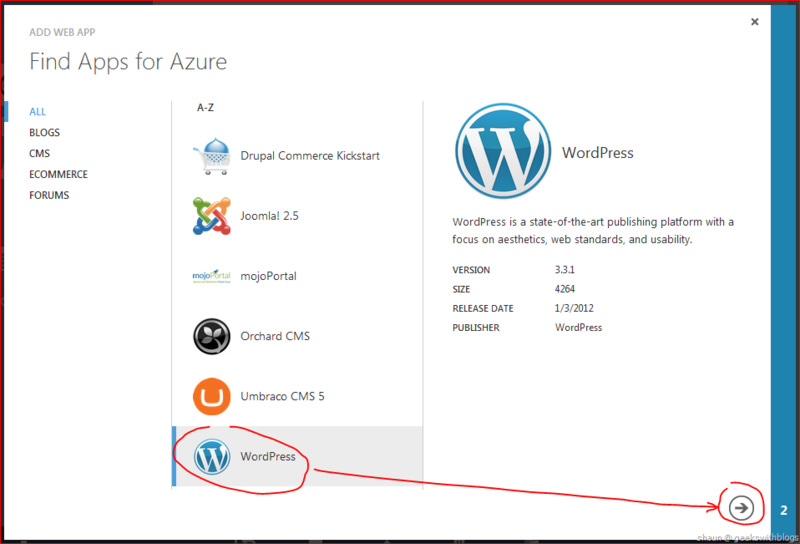 Right click on our web role project and select “Manage NuGet packages”, and then search the package named “WindowsAzure.Caching”. 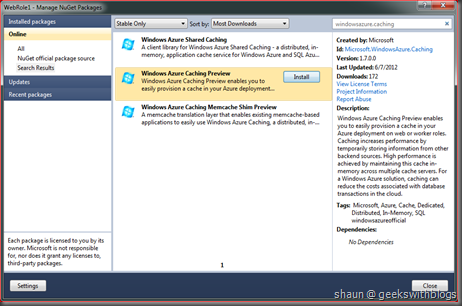 In the package list install the “Windows Azure Caching Preview”. It will download all necessary references from the NuGet repository and update our Web.config as well. Open the Web.config of our web role and find the “dataCacheClients” node. Under this node we can specify the cache clients we are going to use. 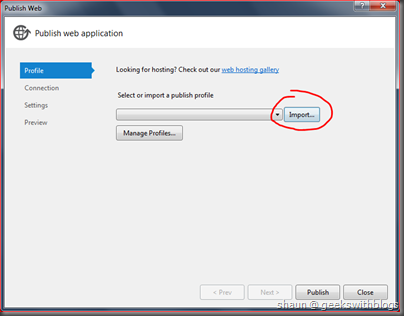 For each cache client it will use the role name to identity and find the cache. Since we only have this web role with the Caching (Preview) enabled so I pasted the current role name in the configuration. 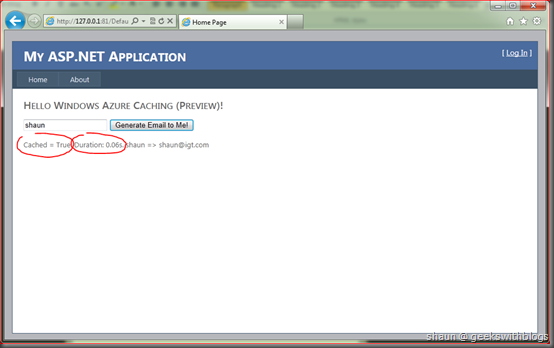 Then, in the default page I will add some code to show how to use the cache. I will have a textbox on the page where user can input his or her name, then press a button to generate the email address for him/her. And in backend code I will check if this name had been added in cache. If yes I will return the email back immediately. Otherwise, I will sleep the tread for 2 seconds to simulate the latency, then add it into cache and return back to the page. The Caching (Preview) can be used on the local emulator so we just F5. The first time I entered my name it will take about 2 seconds to get the email back to me since it was not in the cache. But if we re-enter my name it will be back at once from the cache. Since the Caching (Preview) is distributed across all instances of the role, so we can scaling-out it by scaling-out our web role. Just use 2 instances and tweak some code to show the current instance ID in the page, and have another try. Then we can see the cache can be retrieved even though it was added by another instance. 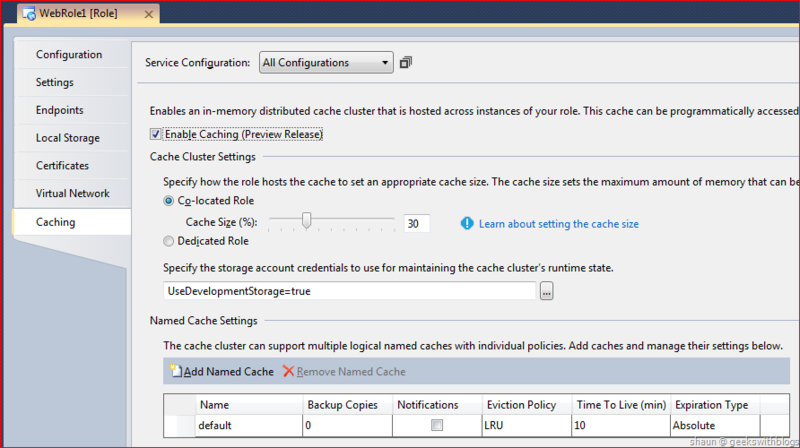 As I mentioned, the Caching (Preview) can be consumed by all other roles within the same cloud service. 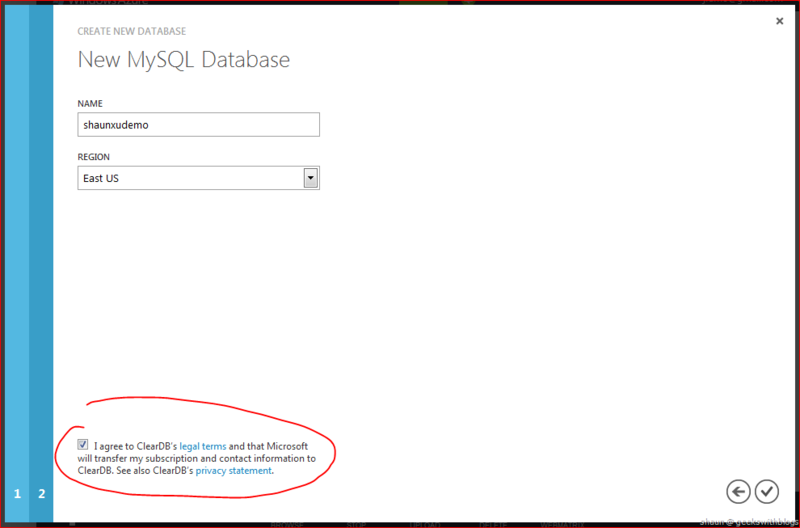 For example, let’s add another web role in our cloud solution and add the same code in its default page. 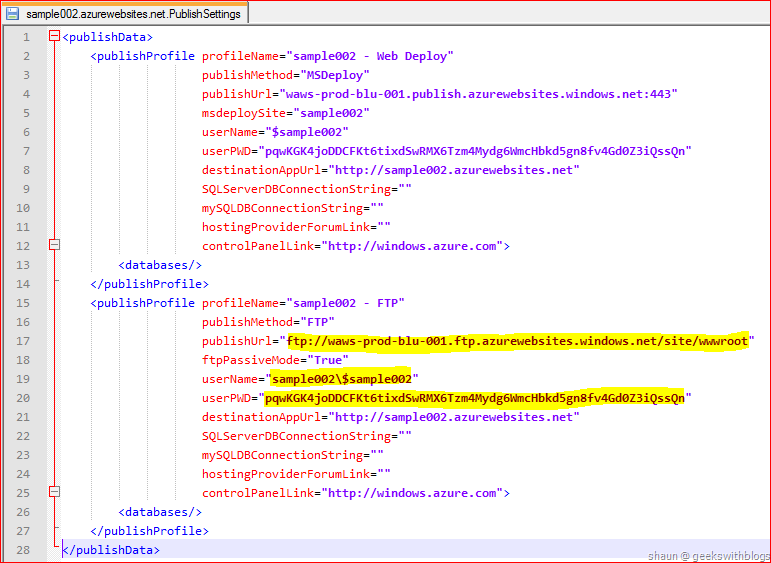 In the Web.config we add the cache client to one enabled in the last role, by specifying its role name here. Then we start the solution locally and go to web role 1, specify the name and let it generate the email to us. Since there’s no cache for this name so it will take about 2 seconds but will save the email into cache. And then we go to web role 2 and specify the same name. Then you can see it retrieve the email saved by the web role 1 and returned back very quickly. Finally then we can upload our application to Windows Azure and test again. 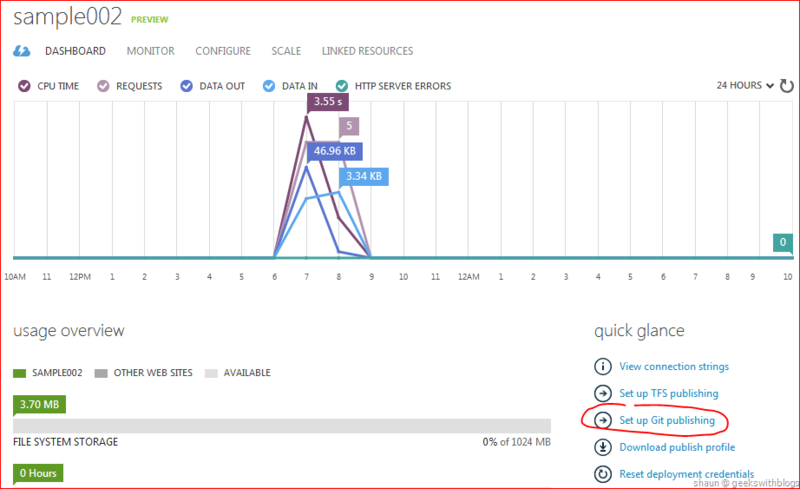 Make sure you had changed the cache cluster status storage account to the real azure account. As a in-memory distributed caching solution, the Caching (Preview) has some fancy features I would like to highlight here. The first one is the high availability support. This is the first time I have heard that a distributed cache support high availability. In the distributed cache world if a cache cluster was failed, the data it stored will be lost. This behavior was introduced by Memcached and is followed by almost all distributed cache productions. 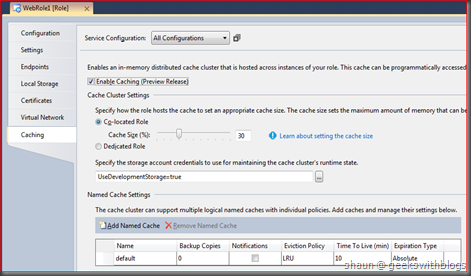 But Caching (Preview) provides high availability, which means you can specify if the named cache will be backup automatically. If yes then the data belongs to this named cache will be replicated on another role instance of this role. Then if one of the instance was failed the data can be retrieved from its backup instance. 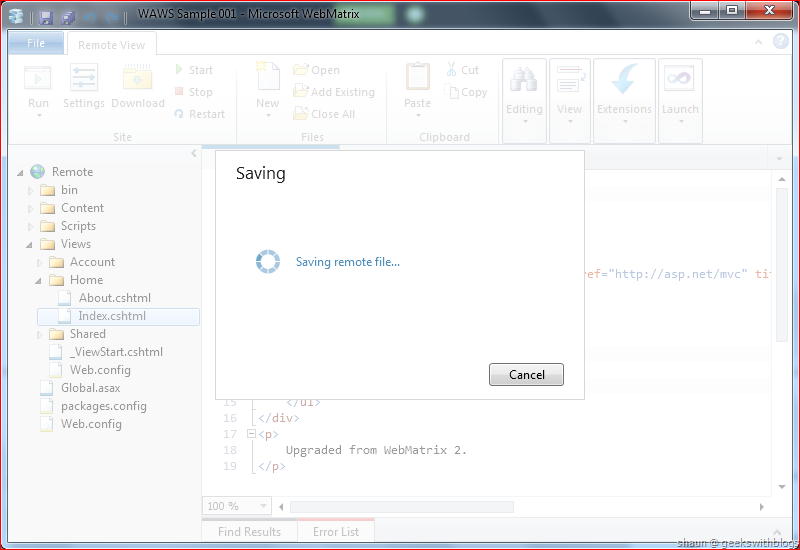 To enable the backup just open the Caching page in Visual Studio. In the named cache you want to enable backup, change the Backup Copies value from 0 to 1. The value of Backup Copies only for 0 and 1. 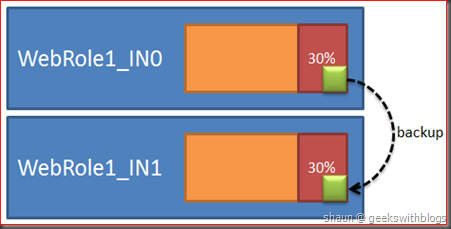 “0” means no backup and no high availability while “1” means enabled high availability with backup the data into another instance. But by using the high availability feature there are something we need to make sure. Firstly the high availability does NOT means the data in cache will never be lost for any kind of failure. For example, if we have a role with cache enabled that has 10 instances, and 9 of them was failed, then most of the cached data will be lost since the primary and backup instance may failed together. But normally is will not be happened since MS guarantees that it will use the instance in the different fault domain for backup cache. Another one is that, enabling the backup means you store two copies of your data. For example if you think 100MB memory is OK for cache, but you need at least 200MB if you enabled backup. 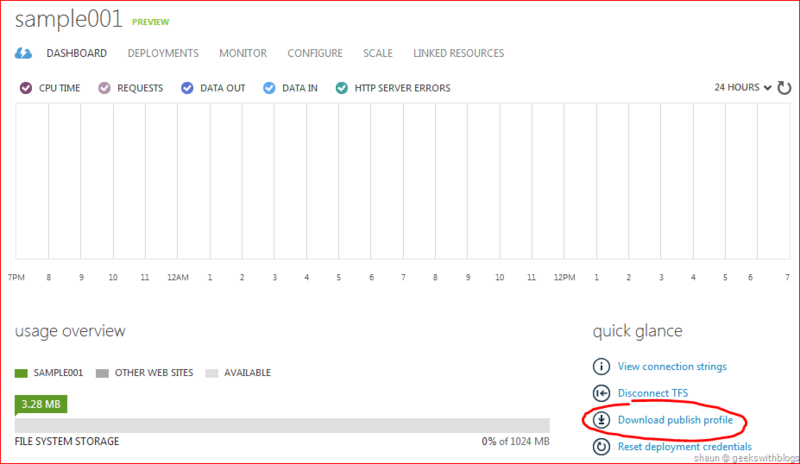 Besides the high availability, the Caching (Preview) support more features introduced in Windows Server AppFabric Caching than the Windows Azure Shared Caching. It supports local cache with notification. It also support absolute and slide window expiration types as well. And the Caching (Preview) also support the Memcached protocol as well. This means if you have an application based on Memcached, you can use Caching (Preview) without any code changes. What you need to do is to change the configuration of how you connect to the cache. 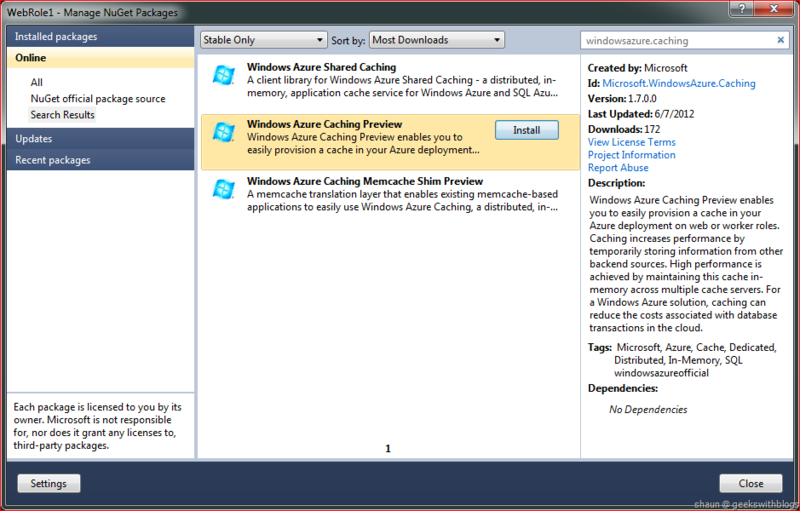 Similar as the Windows Azure Shared Caching, MS also offers the out-of-box ASP.NET session provider and output cache provide on top of the Caching (Preview). Caching is very important component when we building a cloud-based application. 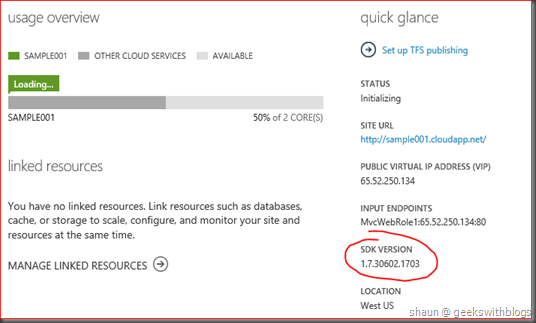 In the June 2012 update MS provides a new cache solution named Caching (Preview). 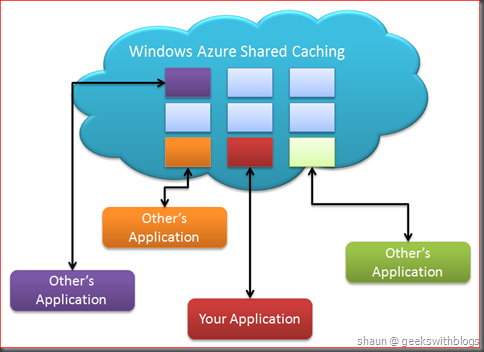 Different from the existing Windows Azure Shared Caching, Caching (Preview) runs the cache cluster within the role instances we have deployed to the cloud. It gives more control, more performance and more cost-effect. 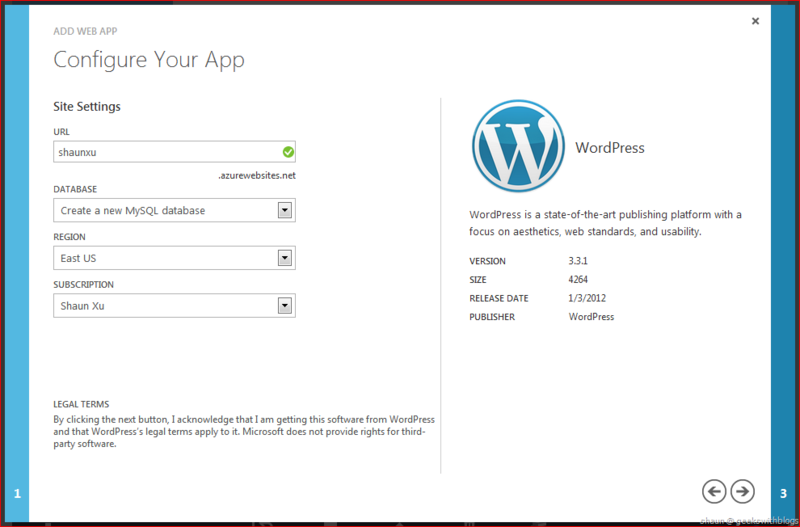 So now we have two caching solutions in Windows Azure, the Shared Caching and Caching (Preview). If you need a central cache service which can be used by many cloud services and web sites, then you have to use the Shared Caching. But if you only need a fast, near distributed cache, then you’d better use Caching (Preview). 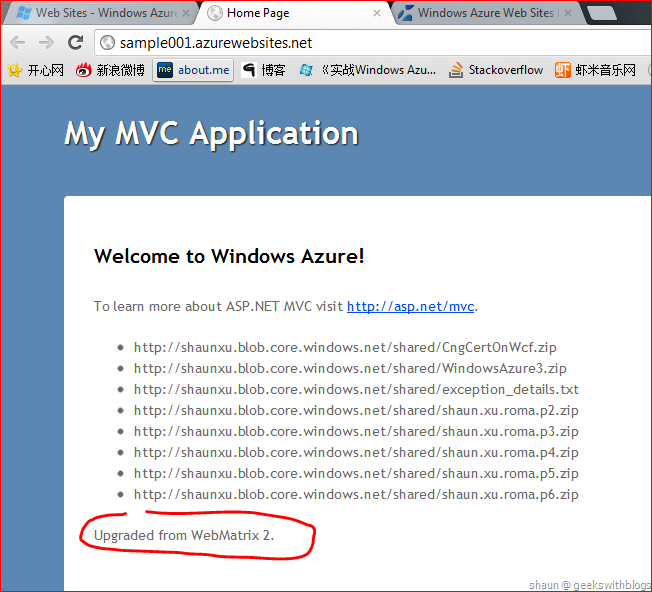 So this is the fourth blog post about the new features of Windows Azure and the second part of Windows Azure Web Sites. 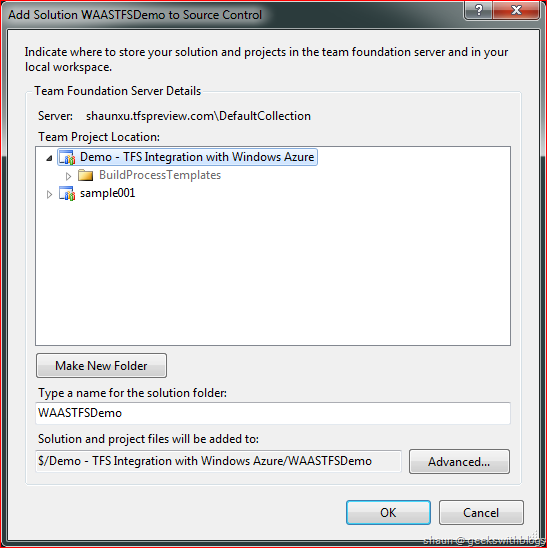 But this is not just focus on the WAWS since the function I’m going to introduce is available in both Windows Azure Web Sites and Windows Azure Cloud Service (a.k.a. hosted service). 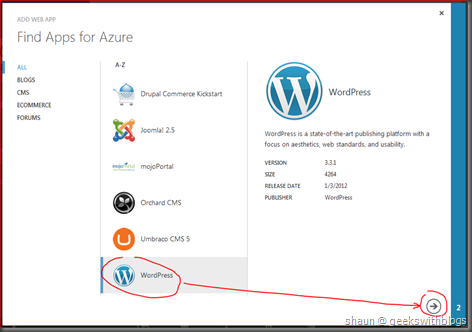 In the previous post I talked about the Windows Azure Web Sites and how to use its gallery to build a WordPress personal blog without coding. Besides the gallery we can create an empty web site and upload our website from vary approaches. And one of the highlighted feature here is that, we can make our web site integrated with a source control service, such as TFS and Git, so that it will be deployed automatically once a new commit or build available. 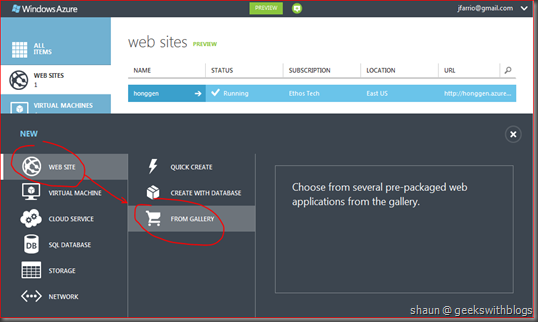 In the developer portal when creating a new web site, we can select QUICK CREATE item. This will create an empty web site with only one shared instance without any database associated. Let’s specify the URL, region and subscription and click OK.
After a few seconds our website will be ready. And now we can click the BROWSE button to open this empty website. As you can see there is a welcome page available in my website even thought I didn’t upload or deploy anything. This means even though the website will be charged even before anything was deployed, similar as the cloud service (hosted service). It is because once we created a website, Windows Azure platform had arranged a hosting process (w3wp.exe) in the group of virtual machines. 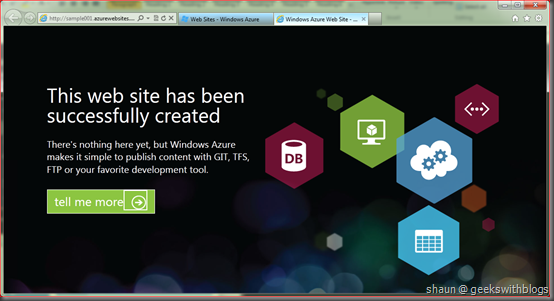 Currently the Windows Azure Web Sites can integrate with TFS and Git as its deployment source, and it only support the Microsoft TFS Preview Service for now. 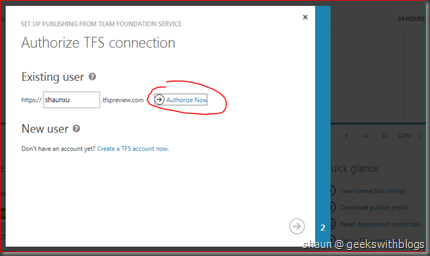 I will not deep into how to use the TFS preview service in this post but once we click into the website we had just created and then clicked the “Set up TFS publishing”, there will be a dialog helping us to connect to this service. If you don’t have an account you can click the link shown below to request one. Assuming we have already had an account of TFS service then we need to create a new project firstly. 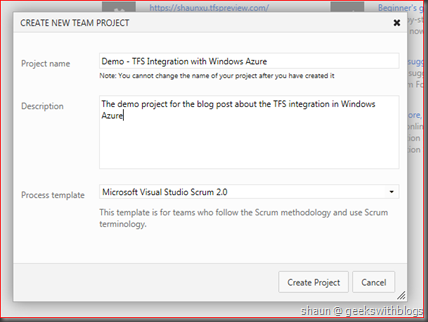 Go to your TFS service website and create a new project, giving the project name, description and the process template. 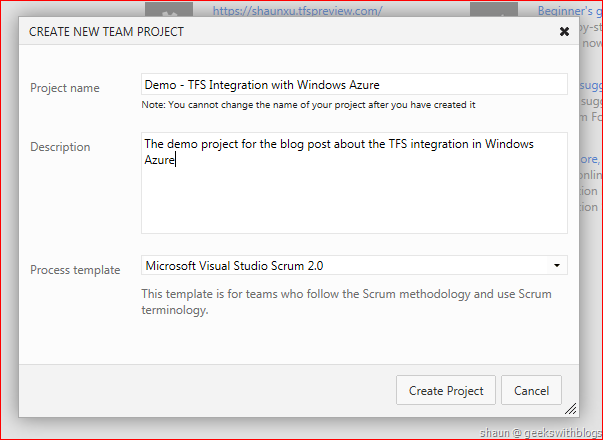 Then, back to the developer portal and clicked the “Set up TFS publishing” link. 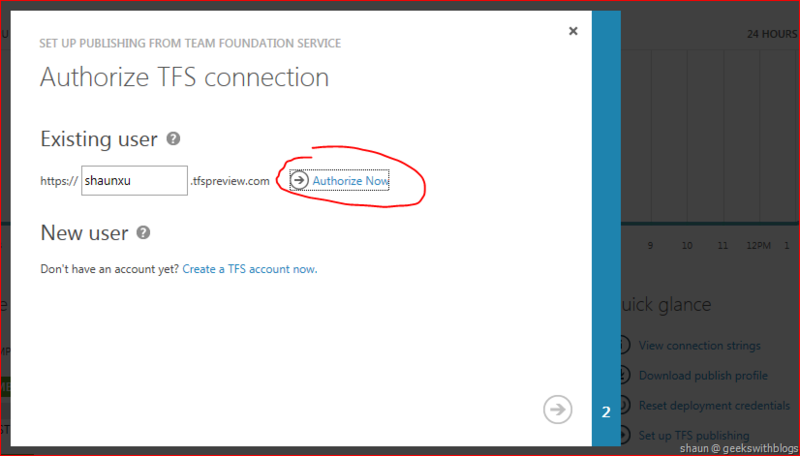 In the popping up window I will provide my TFS service URL and click the “Authorize now” link. 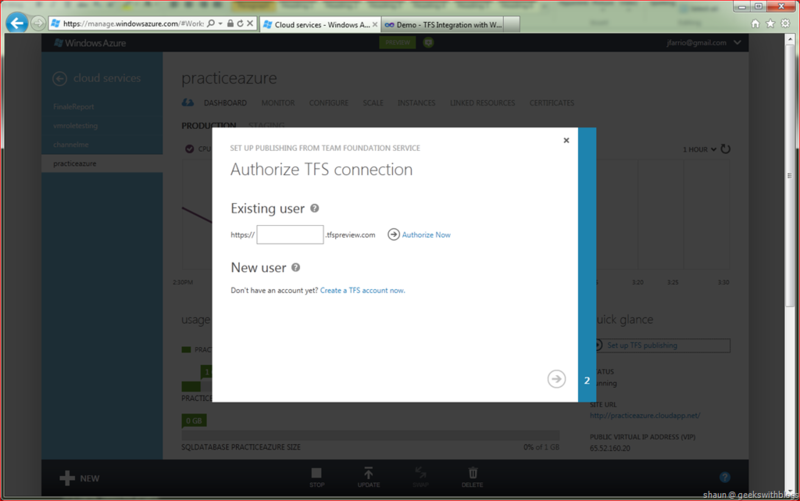 Click “Accept” button to allow my windows azure to connect to my TFS service. Then it will be back to the developer portal and list all projects in my account. Just select the one I had just created and click OK.
Then our website is linking to the TFS project I specified and finally it will show similar like this below. This means the web site had been linked to the TFS successfully. 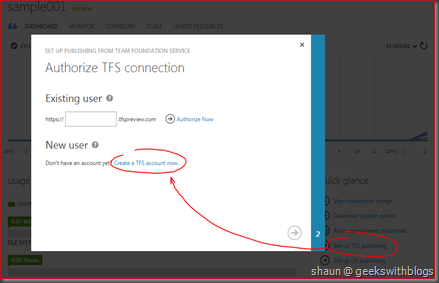 In the figure above there are some links to guide us how to connect to the TFS server through Visual Studio 2010 and 2012 RC. 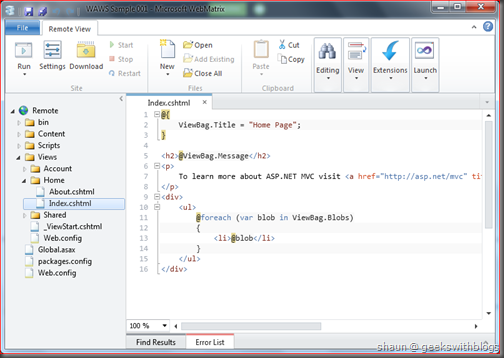 If you are using Visual Studio 2012 RC, you don’t need any extension. 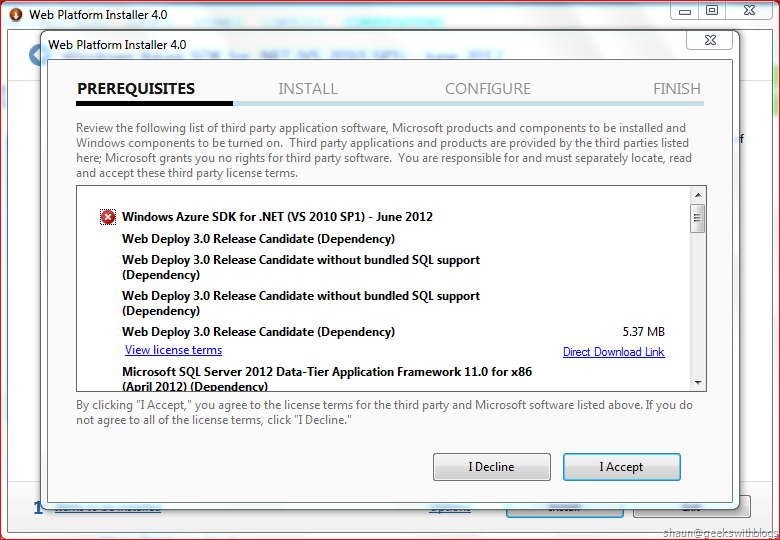 But if you are using Visual Studio 2010 you must have SP1 and KB2581206 installed. 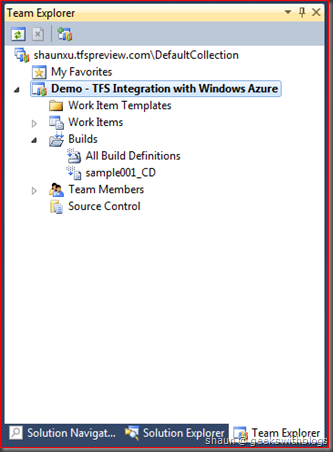 To connect to my TFS service just open the Visual Studio and in the Team Explorer, we can add a new TFS server and paste the URL of my TFS service from the developer portal. And select the project I had just created, then it will be listed in my Team Explorer. Now let’s start to build our website. Since the website we are going to build will be deployed to WAWS, it’s NOT a cloud service, NOT a web role. 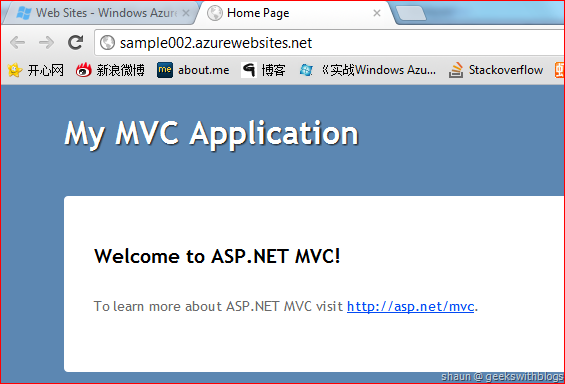 So in this case we need to create a normal ASP.NET web application. 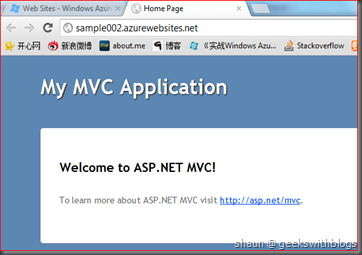 For example, an ASP.NET MVC 3 web application. Next, right click on the solution and select “Add Solution to Source Control”, select the project I had just created. Then check my code in. Once the check-in finished we can see that there is a build running in the TFS server. 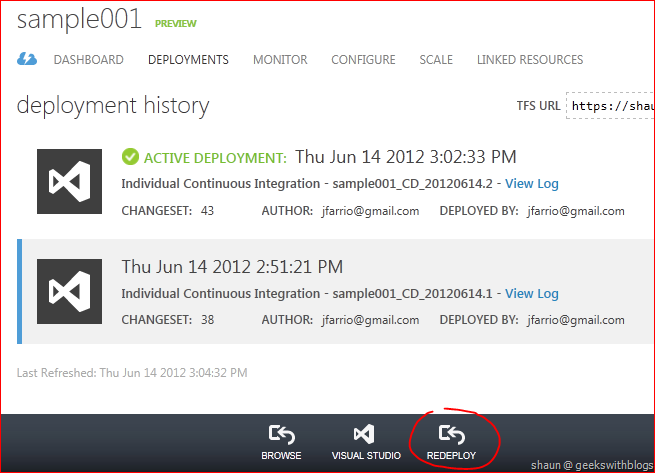 And if we back to the developer portal, we will see in our web site deployment page there’s a deployment running. 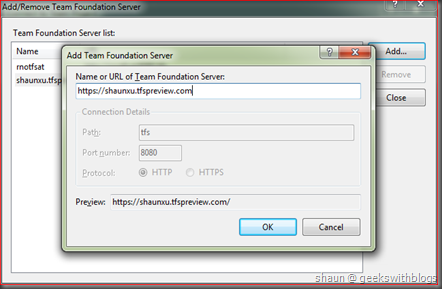 In fact, once we linked our web site to our TFS then it will create a new build definition in our TFS project. It will be triggered by each check-in and deploy to the web site we linked automatically. 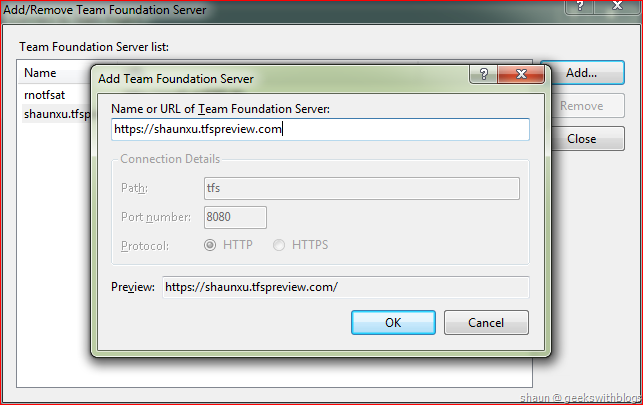 So that when our code had been compiled it will be published to our web site from our TFS server. Once the build and deployment finished we can see it’s now active on our developer portal. 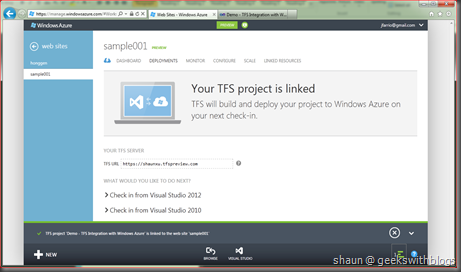 Now we can see the web site that created from my Visual Studio and deployed by my TFS. 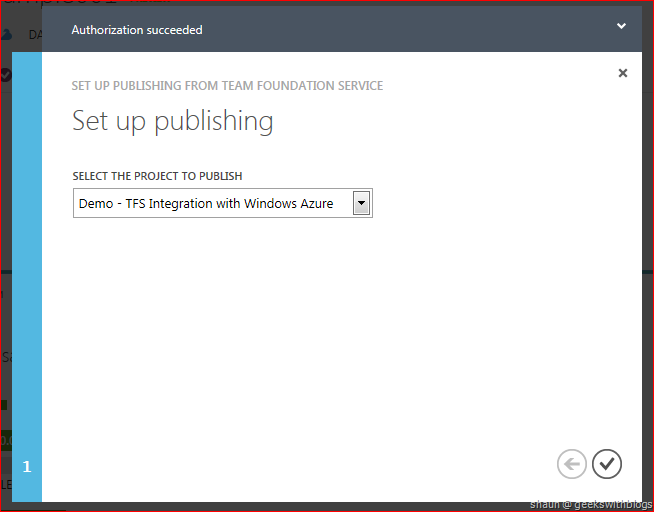 A big benefit when using TFS publishing is the continue deployment. Now if I changed some code in my Visual Studio, for example update some text on the home page and check in my changes, then it will trigger an new build and deploy to my WAWS automatically. And even more, if we wanted to rollback to a previous version we can just select an existing deployment listed in the portal and click REDEPLOY at the bottom. Q&A: Can Web Site use Storage work with a Worker Role? Stacy asked a question in my previous post, which was “can a web site use Windows Azure Storage and furthermore working with a worker role”. 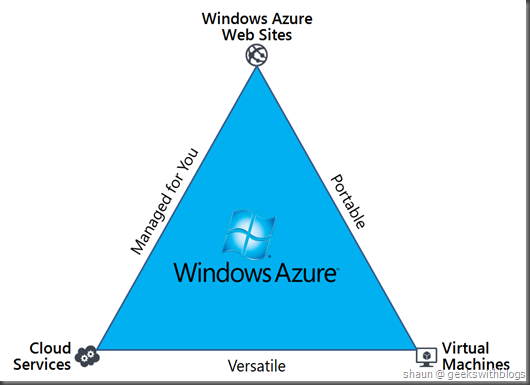 Since the web site is deployed on the windows azure virtual machines in data center, it must be able to use all windows azure features such as the storage, SQL databases, CDN, etc.. But since when using web site we normally have a standard ASP.NET web application, PHP website or NodeJS, the windows azure SDK was not referenced by default. But we can add them by ourselves. In our sample project let’s right click on my MVC project and clicked the “Manage NuGet packages”. 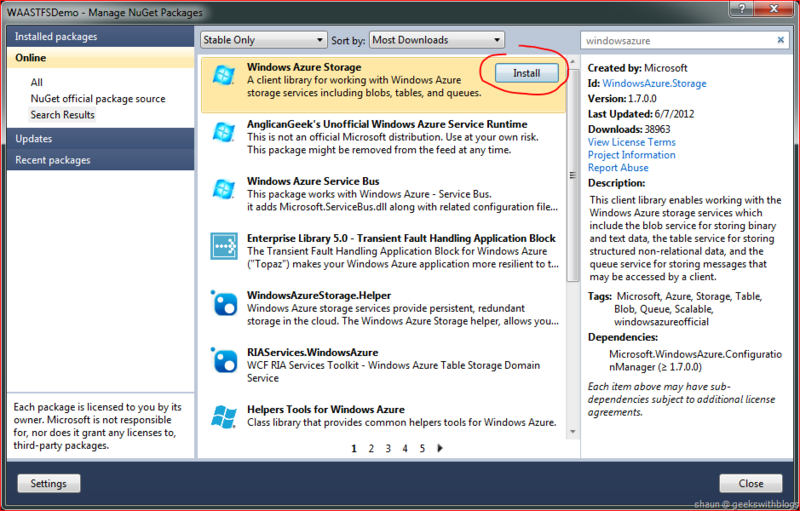 And in the dialog I will search windows azure packages and select the “Windows Azure Storage” to install. 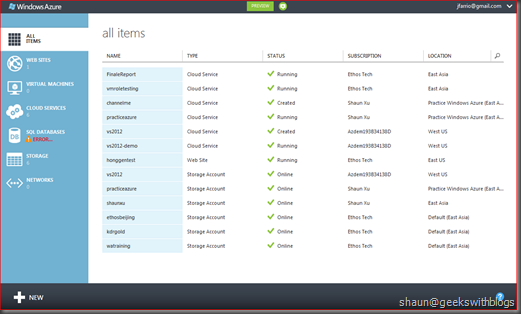 Then we will have the assemblies to access windows azure storage such as tables, queues and blobs. Since I have a storage account already, let’s have a quick demo, just to list all blobs in a container. The code would be like this. 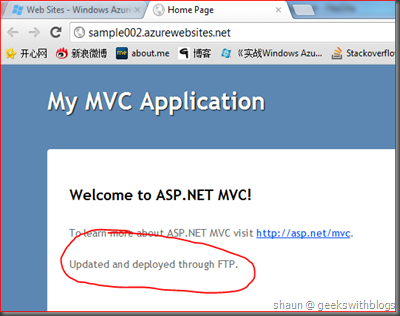 7:     To learn more about ASP.NET MVC visit <a href="http://asp.net/mvc" title="ASP.NET MVC Website">http://asp.net/mvc</a>. And then just check in the code, it will be deployed to my web site. Finally we can see the blobs in my storage. This is just an example but it proves that web sites can connect to storage, table, blob and queue as well. So the answer to Stacy should be “yes”. The web site can use queue storage to work with worker role. 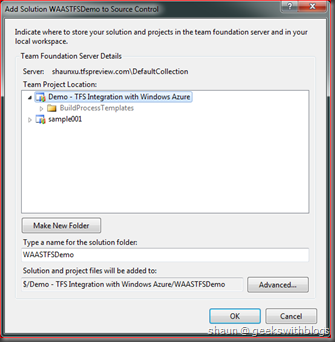 In this post I demonstrated how to integrate with TFS from Windows Azure Web Sites. 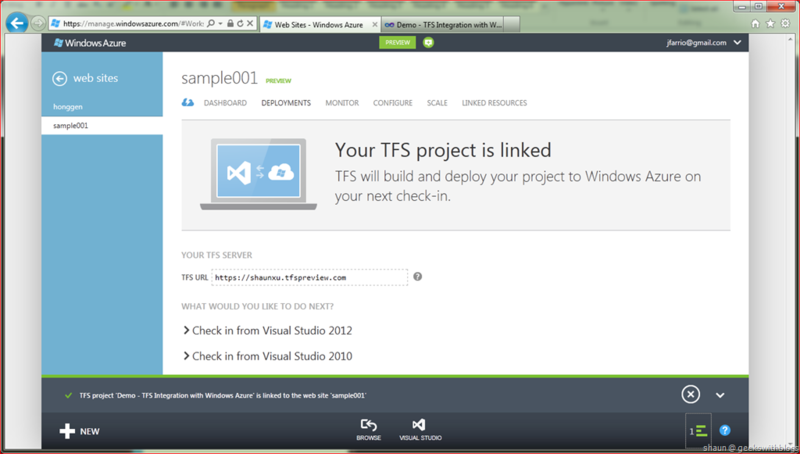 You can see our website can be built, uploaded and deployed automatically by TFS service. All we need to do is to provide the TFS name and select the project. 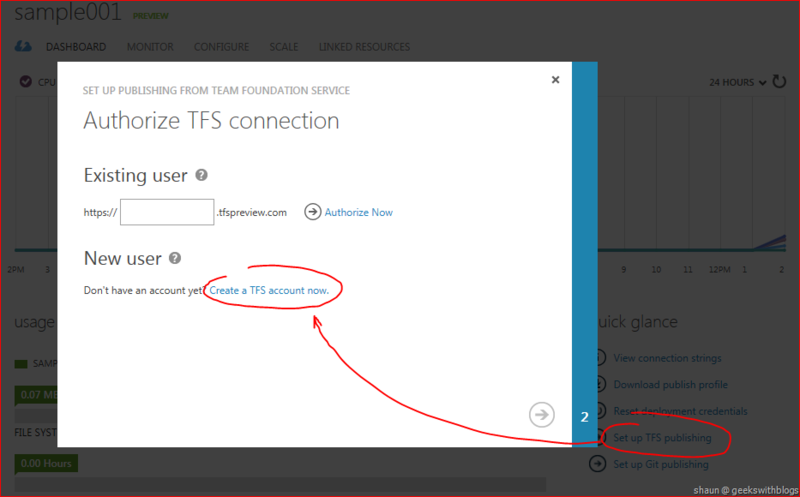 Not only the Windows Azure Web Site, in this upgrade the Windows Azure Cloud Services (hosted service) can be published through TFS as well. Very similar as what we have shown below. 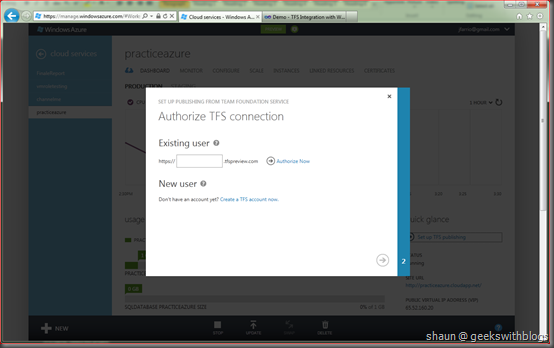 But currently, only Microsoft TFS Service Preview can be integrated with Windows Azure. 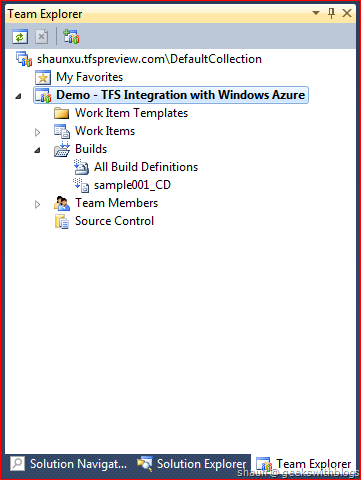 But I think in the future we can link the TFS in our enterprise and some 3rd party TFS such as CodePlex to Windows Azure. 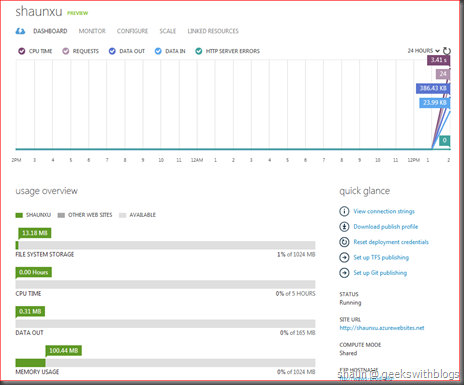 This is the 3rd post of my Windows Azure Evolution series, focus on the new features and enhancement which was alone with the Windows Azure Platform Upgrade June 2012, announced at the MEET Windows Azure event on 7th June. In the first post I introduced the new preview developer portal and how to works for the existing features such as cloud services, storages and SQL databases. 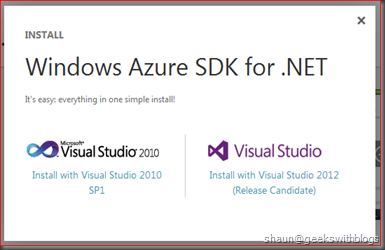 In the second one I talked about the Windows Azure .NET SDK 1.7 on the latest Visual Studio 2012 RC on Windows 8. From this one I will begin to introduce some new features. 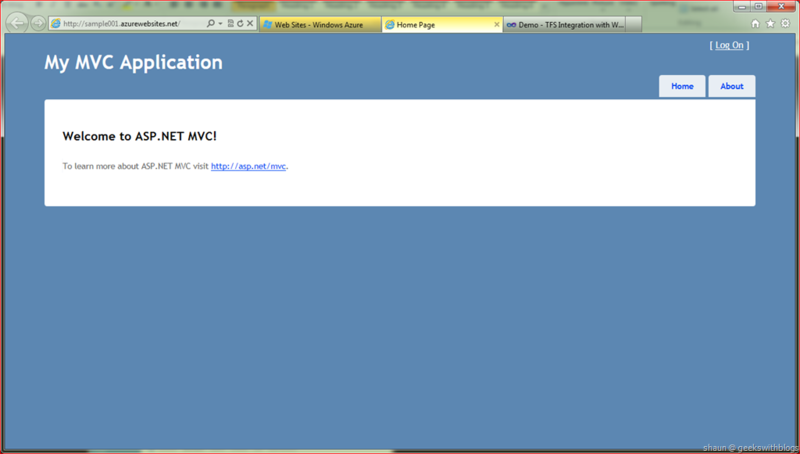 Now let’s have a look on the first one of them, Windows Azure Web Sites. 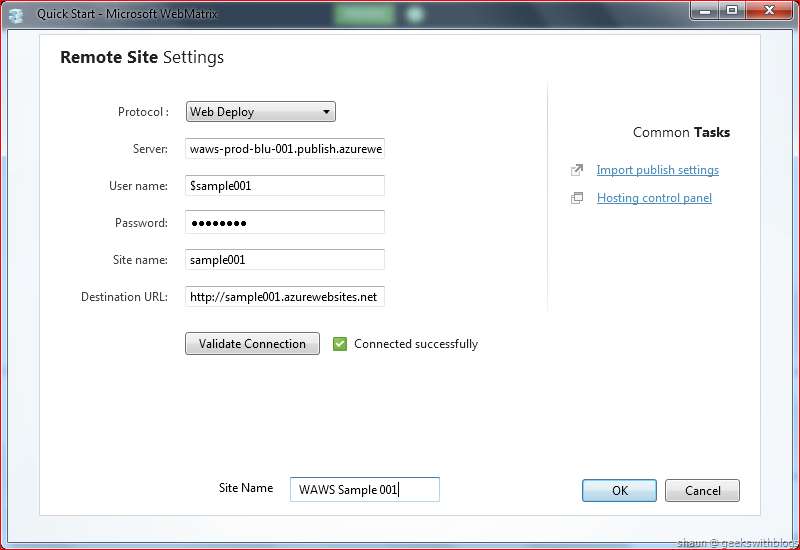 Windows Azure Web Sites (WAWS), as known as Antares, was a new feature still in preview stage in this upgrade. It allows people to quickly and easily deploy websites to a highly scalable cloud environment, uses the languages and open source apps of the choice then deploy such as FTP, Git and TFS. 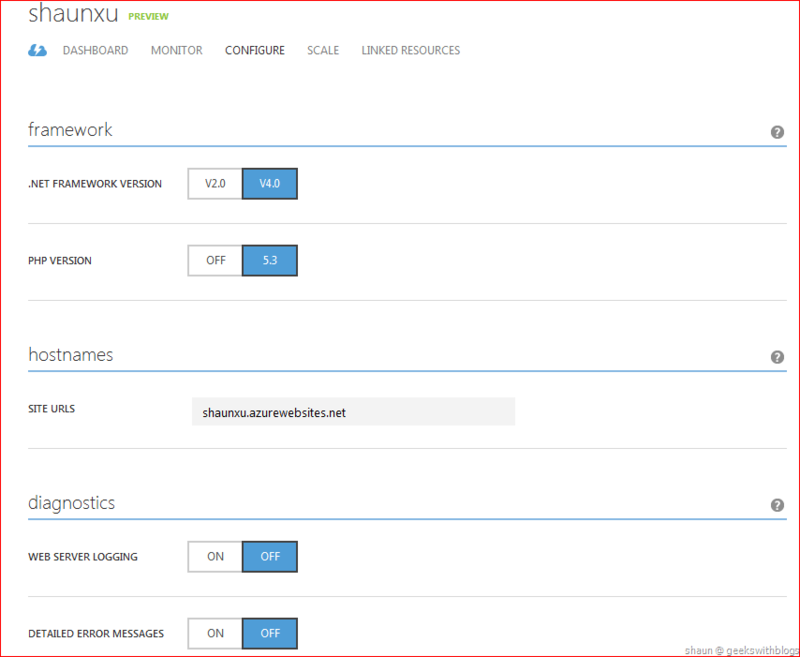 It also can be integrated with Windows Azure services like SQL Database, Caching, CDN and Storage easily. After read its introduction we may have a question: since we can deploy a website from both cloud service web role and web site, what’s the different between them? So, let’s have a quick compare. Architecture Multi layered, background worker, message queuing, etc.. Simple website with backend database. 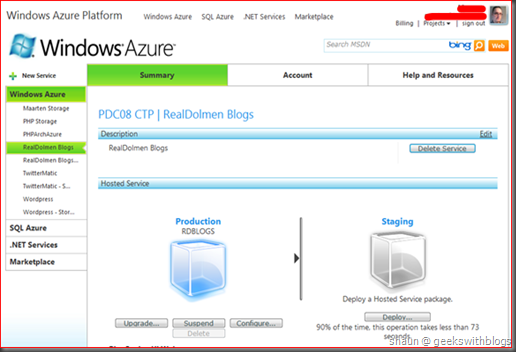 VS Project Windows Azure Cloud Service ASP.NET Web Form, ASP.NET MVC, etc..
Out-of-box Gallery (none) Drupal, DotNetNuke, WordPress, etc..
As you can see, there are many difference between the cloud service and web site, but the main point is that, the cloud service focus on those complex architecture web application. For example, if you want to build a website with frontend layer, middle business layer and data access layer, with some background worker process connected through the message queue, then you should better use cloud service, since it provides full control of your code and application. But if you just want to build a personal blog or a business portal, then you can use the web site. Since the web site have many galleries, you can create them even without any coding and configuration. 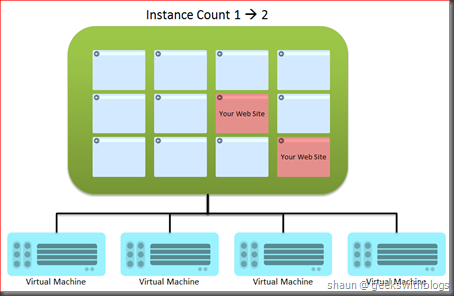 David Pallmann have an awesome figure explains the benefits between the could service, web site and virtual machine. As I mentioned above, one of the big feature in WAWS is to build a website from an existing gallery, which means we don’t need to coding and configure. What we need to do is open the windows azure developer portal and click the NEW button, select WEB SITE and FROM GALLERY. In the popping up windows there are many websites we can choose to use. For example, for personal blog there are Orchard CMS, WordPress; for CMS there are DotNetNuke, Drupal 7, mojoPortal. 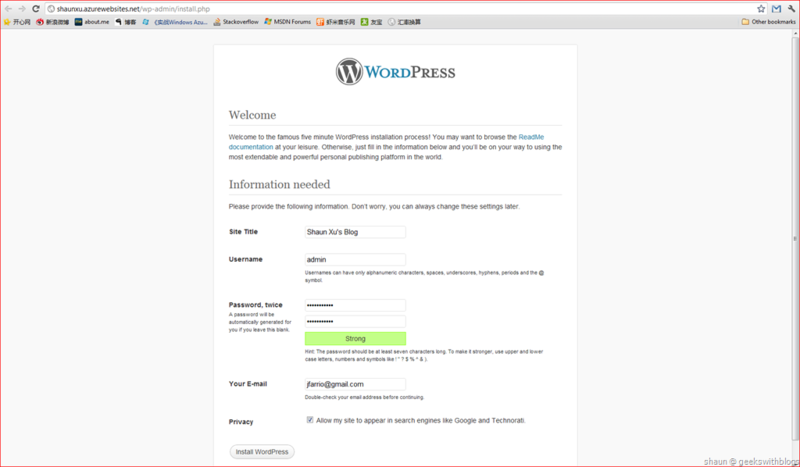 Let’s select WordPress and click the next button. The next step is to configure the web site. We will need to specify the DNS name and select the subscription and region. Since the WordPress uses MySQL as its backend database, we also need to create a MySQL database as well. 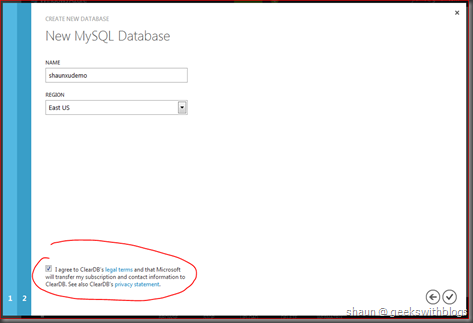 Windows Azure Web Sites utilize ClearDB to host the MySQL databases. You cannot create a MySQL database directly from SQL Databases section. Finally, since we selected to create a new MySQL database we need to specify the database name and region in the last step. Also we need to accept the ClearDB’s terms as well. 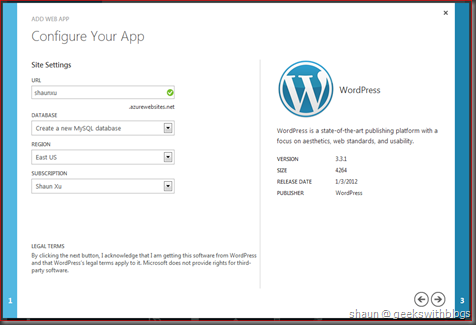 Then windows azure platform will download the WordPress codes and deploy the MySQL database and website. Then it will be ready to use. 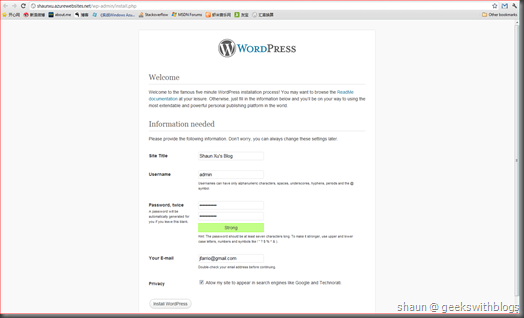 Select the website and click the BROWSE button, the WordPress administration page will be shown. 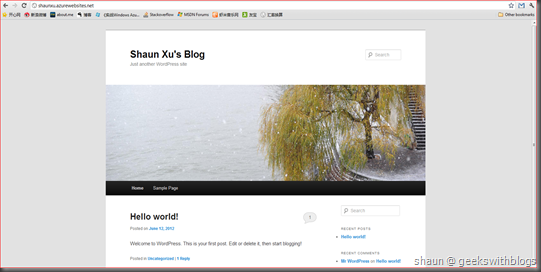 After configured the WordPress here is my personal web blog on the cloud. It took me no more than 10 minutes to establish without any coding. Let’s click into the website I had just created in the portal and have a look on what we can do. In the website details page where are five sections. The overall information about this website, such as the basic usage status, public URL, compute mode, FTP address, subscription and links that we can specify the deployment credentials, TFS and Git publish setting, etc.. Some status information such as the CPU usage, memory usage etc., errors, etc.. We can add more metrics by clicking the ADD METRICS button and the bottom as well. Here we can set the configurations of our website such as the .NET and PHP runtime version, diagnostics settings, application settings and the IIS default documents. This is something interesting. 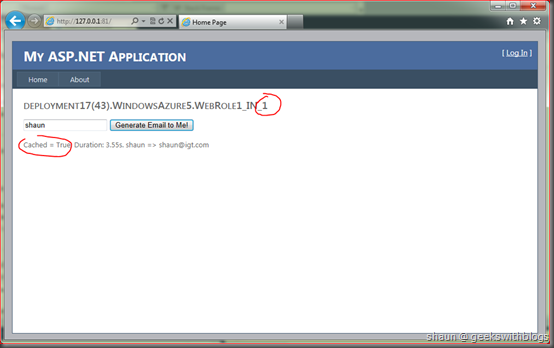 In WAWS there are two compute mode or called web site mode. 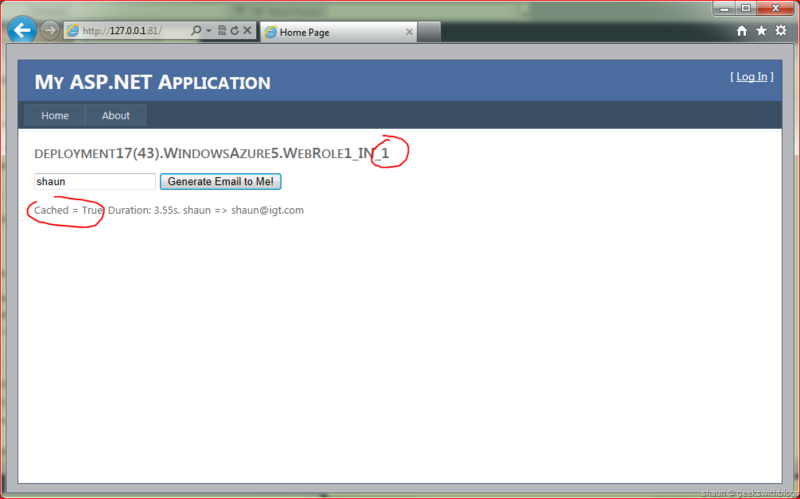 One is “shared”, which means our website will be shared with other web sites in a group of windows azure virtual machines. 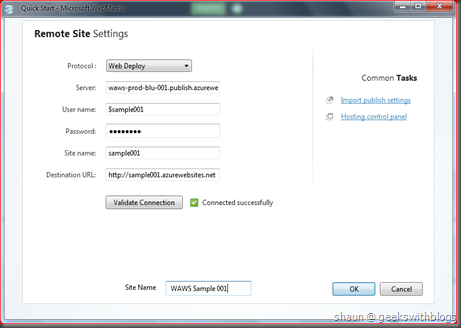 Each web site have its own process (w3wp.exe) with some sandbox technology to isolate from others. When we need to scaling-out our web site in shared mode, we actually increased the working process count. Hence in shared mode we cannot specify the virtual machine size since they are shared across all web sites. 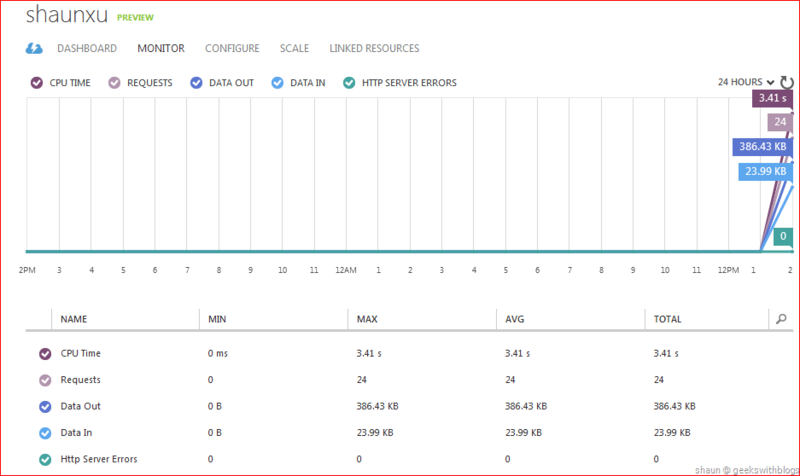 This is a little bit different than the scaling mode of the cloud service (hosted service web role and worker role). 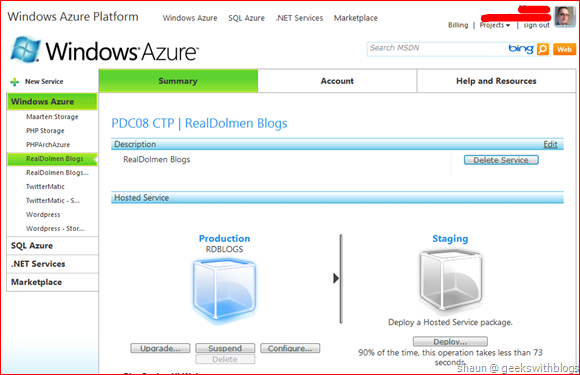 The other mode called “dedicate”, which means our web site will use the whole windows azure virtual machine. This is the same hosting behavior as cloud service web role. In web role it will be deployed on the virtual machines we specified and all of them are only used by us. In web sites dedicate mode, it’s the same. In this mode when we scaling-out our web site we will use more virtual machines, and each of them will only host our own website. And we can specify the virtual machine size in this mode. In the developer portal we can select which mode we are using from the scale section. In shared mode we can only specify the instance count, but in dedicate mode we can specify the instance size as well as the instance count. The MySQL database created alone with the creation of our WordPress web site is a linked resource. We can add more linked resources in this section. For the web site itself, since this feature is in preview period if you are using shared mode, then you will get free up to 10 web sites. But if you are using dedicate mode, the price would be the virtual machines you are using. For example, if you are using dedicate and configured two middle size virtual machines then you will pay $230.40 per month. If there is SQL Database linked to your web site then they will be charged separately based on the Pay-As-You-Go price. For example a 1GB web edition database costs $9.99 per month. And the bandwidth will be charged as well. For example 10GB outbound data transfer costs $1.20 per month. 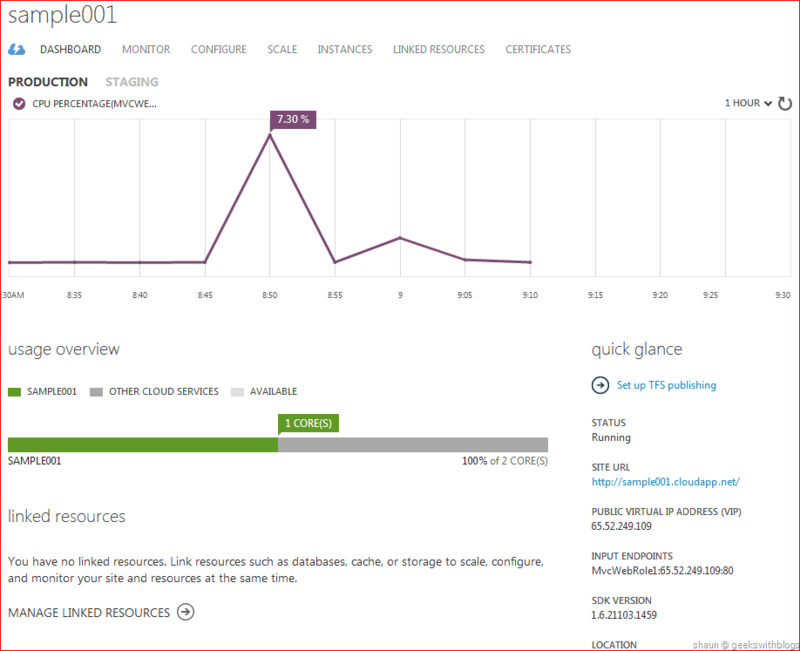 For more information about the pricing please have a look at the windows azure pricing page. 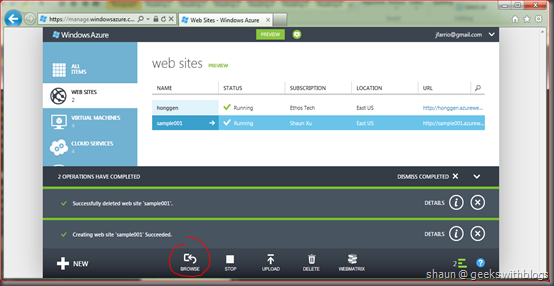 Windows Azure Web Sites gives us easier and quicker way to create, develop and deploy website to window azure platform. Comparing with the cloud service web role, the WAWS have many out-of-box gallery we can use directly. So if you just want to build a blog, CMS or business portal you don’t need to learn ASP.NET, you don’t need to learn how to configure DotNetNuke, you don’t need to learn how to prepare PHP and MySQL. By using WAWS gallery you can establish a website within 10 minutes without any lines of code. But in some cases we do need to code by ourselves. We may need to tweak the layout of our pages, or we may have a traditional ASP.NET or PHP web application which needed to migrated to the cloud. 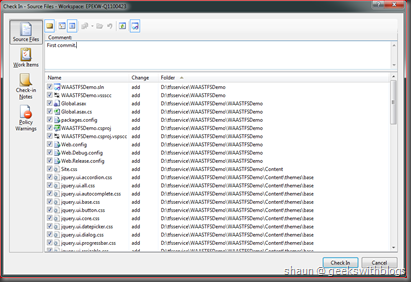 Besides the gallery WAWS also provides many features to download, upload code. 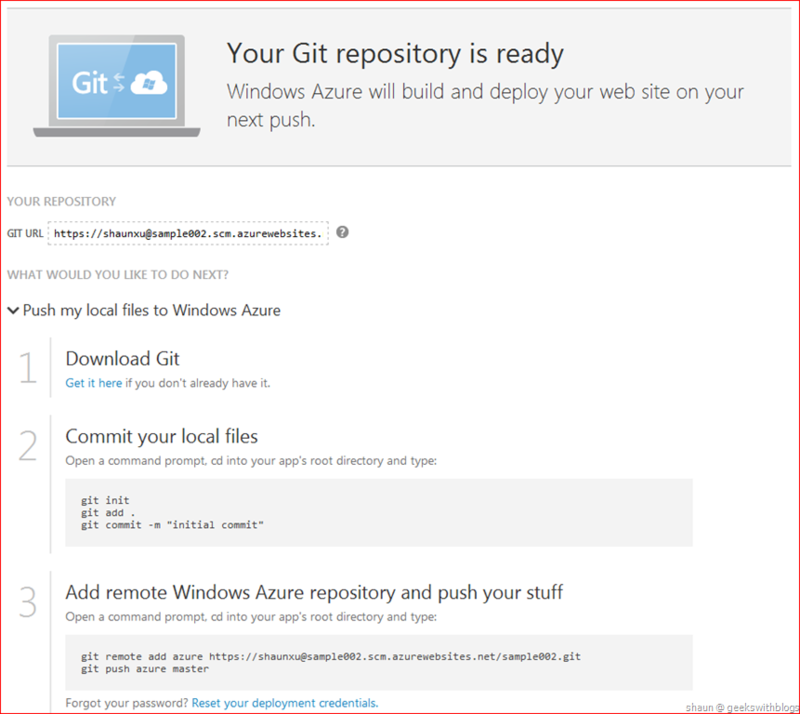 It also provides the feature to integrate with some version control services such as TFS and Git. 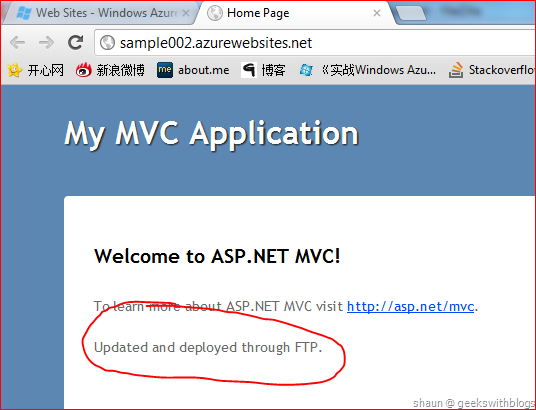 And it also provides the deploy approaches through FTP and Web Deploy. In the next post I will demonstrate how to use WebMatrix to download and modify the website, and how to use TFS and Git to deploy automatically one our code changes committed. When the Microsoft released the first preview version of Windows 8 and Visual Studio, many people in the community were asking if the windows azure tool is available to it. The answer was “NO”. Microsoft promised that the windows azure tool will only support the Visual Studio 2010 but when the 2012 was final released, windows azure tool should be work. 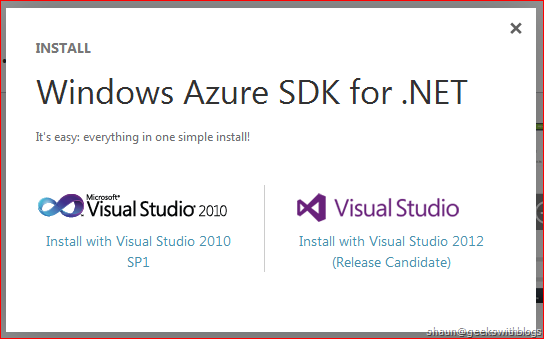 But now alone with the new windows azure platform was published we got the latest Windows Azure SDK 1.7, which is compatible to the Visual Studio 2012 RC. 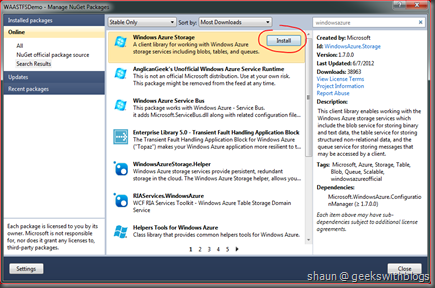 You can retrieve the latest version of the Windows Azure SDK through Web Platform Installer, which I think it’s the easiest and simplest way to download and install, since besides the SDK itself it also needs some other components. 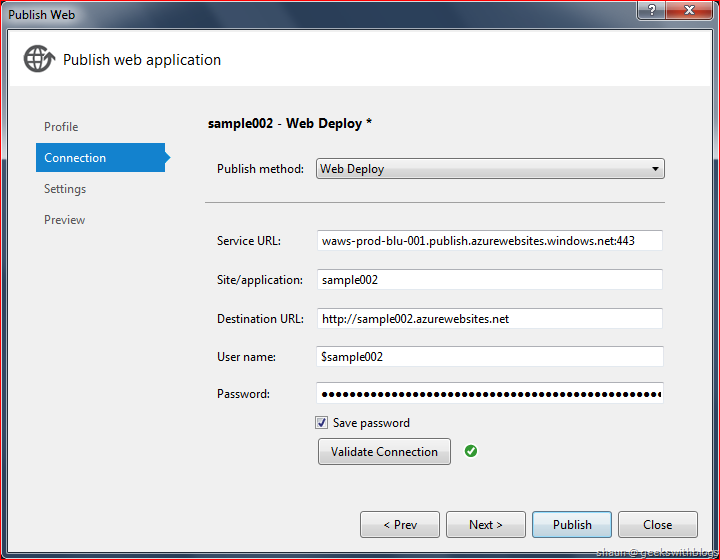 To download the latest windows azure SDK from Web Platform Installer, just go to the windows azure website and clicked the Develop, .NET and click the blue “install” button. 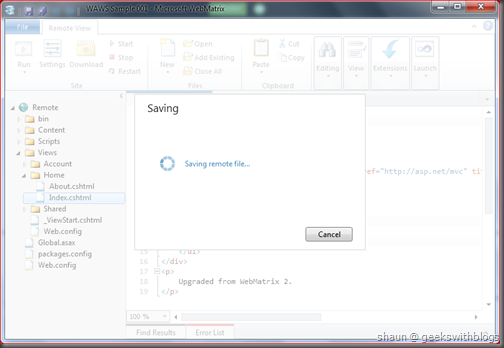 Then you need to select which version of Visual Studio you want to use, Visual Studio 2010 or Visual Studio 2012 RC. After selected the current version you will download an EXE file. 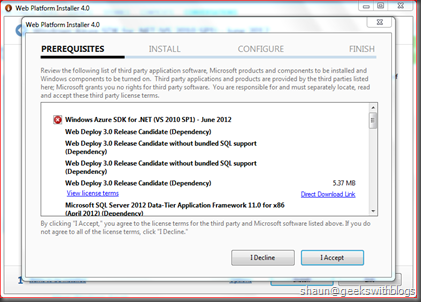 This file will lead you to install the Web Platform Installer 4.0 (if you haven’t installed) and the latest windows azure SDK. You can see the version name is June 2012, 1.7. Finally the WebPI will detect the dependent components you need to download and begin to install. But if you want to challenge yourself you can download the components and install them manually. The standalone installations are listed in this page with the instruction on how to install them with necessary pre-requirements. Once you finished the installation you can open the Visual Studio 2012 RC and as usual, it need to be run as administrator. If you clicked the New Project link from the start page, navigated to Cloud category you will find that there no project template available. Is there anything wrong? 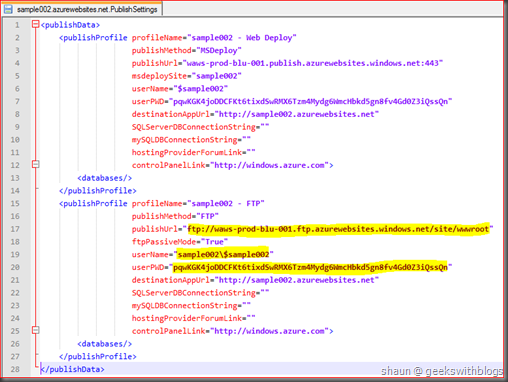 So, if you changed the target framework from the default .NET 4.5 to .NET 4 you will see the azure project template. 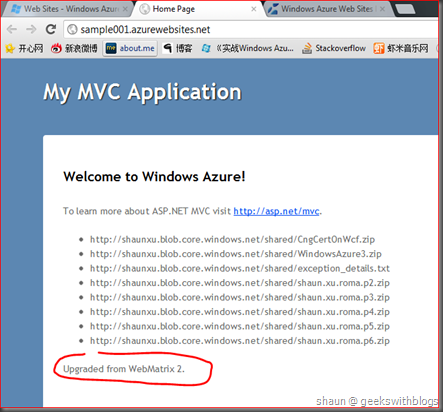 This is because, currently the windows azure instance does not support .NET 4.5. After clicked OK you will see the role creation window, which is similar as what you have seen before. But there are some new role templates in this SDK. Firstly you will have ASP.NET MVC 4 web role available, which means you can create ASP.NET MVC 4 applications for internet, intranet, mobile and WebAPI on the cloud. 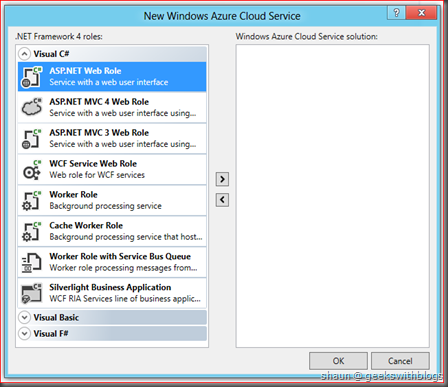 Then there are two new worker role templates, “Cache Worker Role” and “Worker Role with Service Bus Queue”. 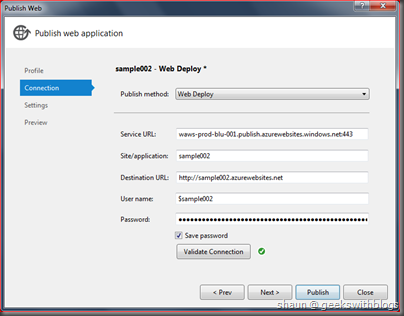 “Worker Role with Service Bus Queue” is a worker role which had added necessary references to access the Windows Azure Service Bus Queue. It also have some basic sample code in the worker role class which could read messages from the queue when started. 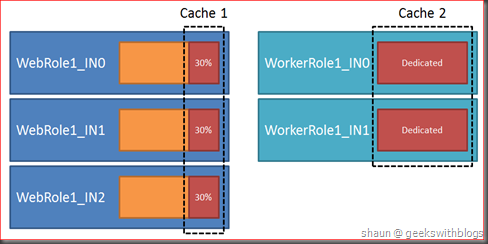 The “Cache Worker Role” is a worker role which has the in-memory distributed cache feature enabled by default. 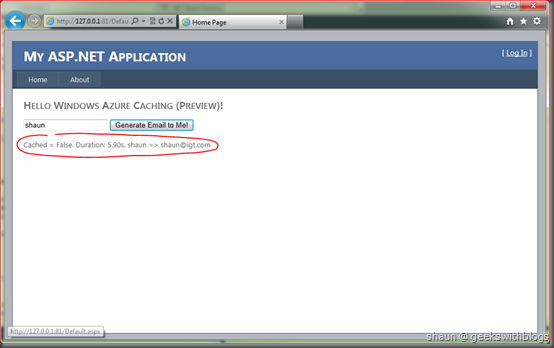 This feature is different than the Windows Azure Caching. It allows the role instance to use its memory as a in-memory distributed cache clusters. By using this feature you can have one or more worker roles as some dedicate cache clusters. Alternatively, you can make part of your web role and worker role’s memory as the cache clusters as well. 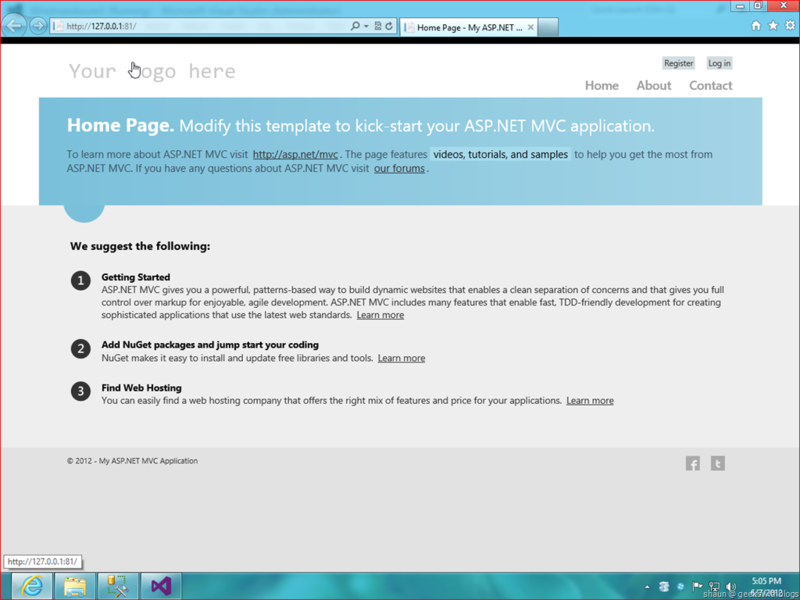 Let’s just create an ASP.NET MVC 4 Web Role, and click F5 to run it under the local emulator. 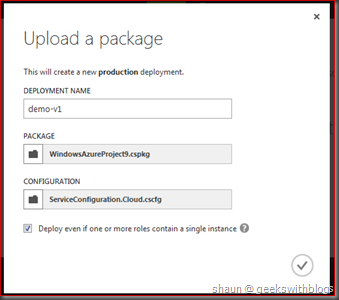 If you have been working with azure for a while you should know that I need to setup the local storage emulator before running locally if it’s a fresh azure SDK installation. But in this version when we started our azure project the Visual Studio will check if the storage emulator had been initialized. If not, it will run the initializer automatically. 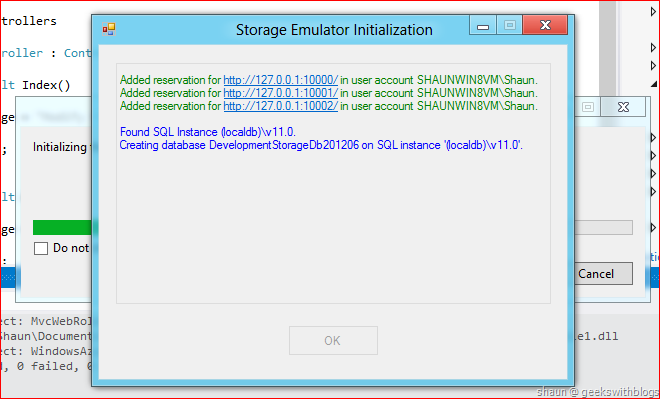 And as you can see, in this version the storage emulator relies on the SQL Server 2012 Local DB feature. It will create the emulator database and tables in the default local database. 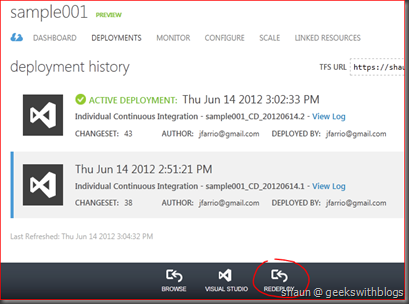 After the Visual Studio complied and deployed the package our website should be shown in the browser. 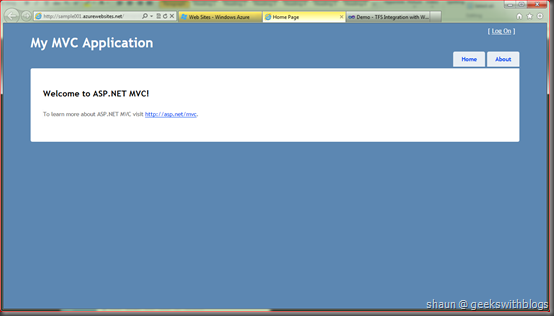 This is the MVC 4 Web Role home page on my Windows 8 machine in IE10. Another thing you might notice is that, in this version the compute emulator utilizes IIS Express to host the web roles instead of the full IIS. You can add breakpoint in the code and debug, and you can use the local storage emulator to test your code for accessing the storage service. All of them are same as what your are doing now on SDK 1.6. 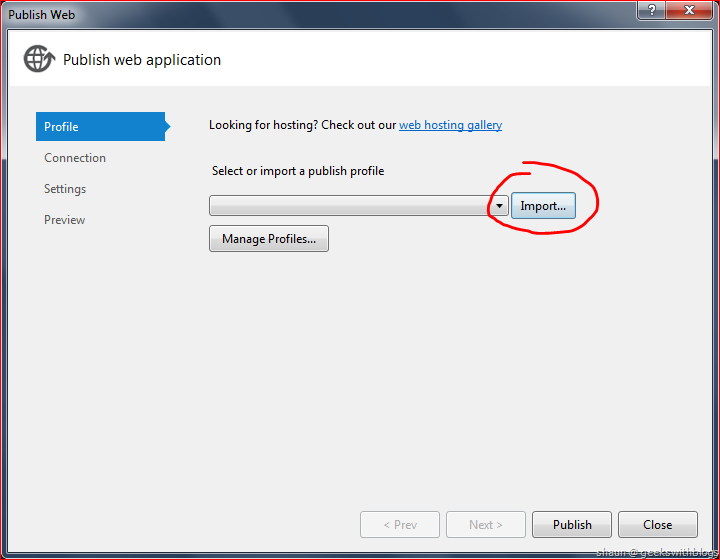 You can switch to use IIS to run your web role in local emulator. 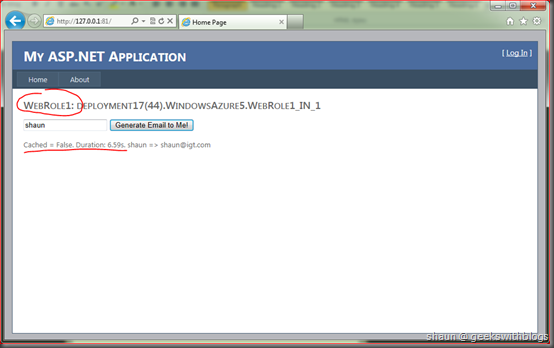 Just open the windows azure porject property windows, in the Web page select “Use IIS Web Server”. For more information about this please have a look on Nuno’s blog post. In the role property page in Visual Studio there’s no massive changes. You can configure your role settings such as the endpoints, certificates and local storage, etc.. One thing was added is the Caching tab. 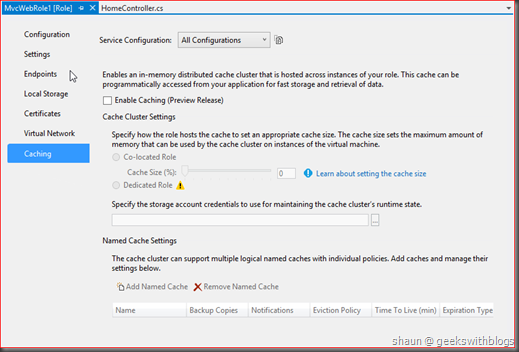 Here you can specify enable the caching feature or not, and how much memory you want to use as the cache cluster. I will introduce more details about it in the future posts. The publish and package feature are also no change. 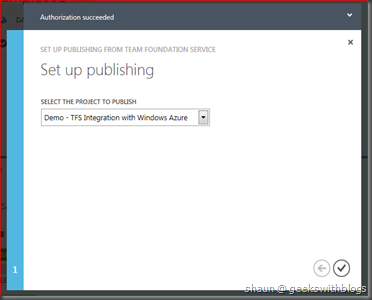 You can publish your project to azure directly through Visual Studio 2012, while you can create the package and upload manually. 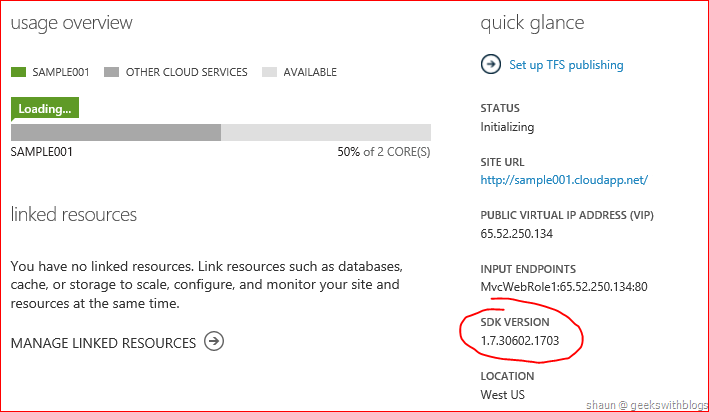 Below is the SDK version of my deployment which is 1.7.30602.1703 in the developer portal. 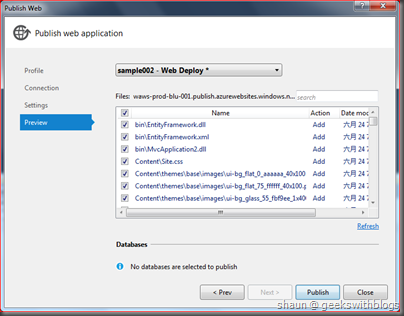 In this post I introduced about the new Windows Azure SDK 1.7 especially on how it works on the latest Visual Studio 2012 RC. 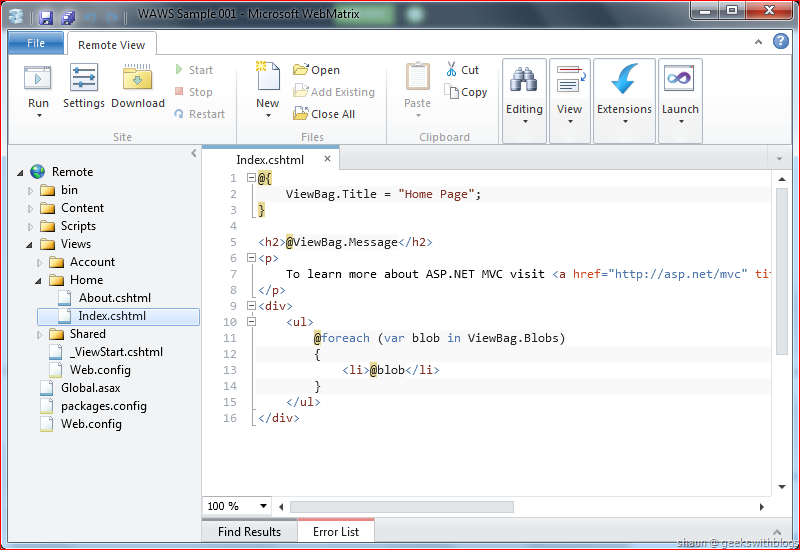 There’s no significant changes in the visual studio tool in this version but some small enhancement such as ASP.NET MVC 4, Cache Worker Role, using SQL 2012 Local DB and IIS Express, etc..
With the MEET Windows Azure event on 7th June, there are many new features and updates in windows azure platform. In the coming several posts I will try to cover some of them. And in the first post here I would like to just have a quick walkthrough of the new preview developer portal. If you have been working with windows azure since 2009 or 2010, you should remember the first version of the developer portal. It was built in HTML with very limited features. I have the impression when I was using is old one. The layout is not that attractive and you have very limited features. On November, 2010 alone with the SDK 1.3 release, the developer portal was getting a big jump. In order to give more usability and features this it turned to be built on Silverlight. 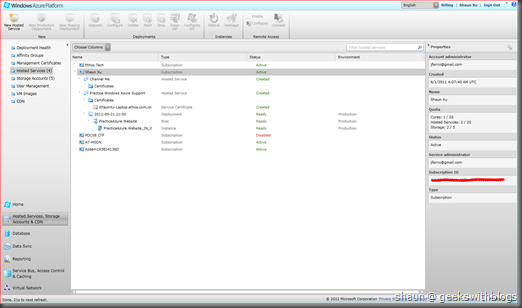 Hence it runs like a desktop application with many windows, lists, commands and context menus. 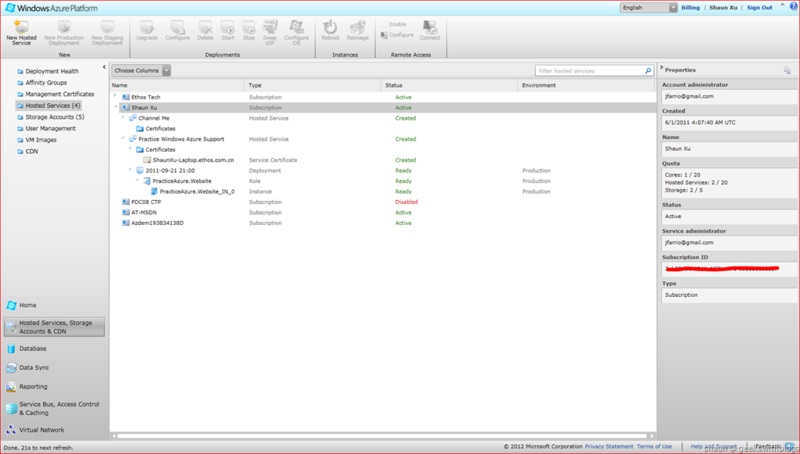 From 2010 till now many features were involved into this portal, such as the remote desktop, co-admin, virtual connect, VM role, etc.. And the portal itself became more and more complicated. But it brought some problems by using the Silverlight. The first one is the browser capability. As you know in most mobile and tablet device the browser doesn’t allow the rich content plugin, such as Flash and Silverlight. This means people cannot open and configure their azure services from their iPad, iPhone and Windows Phone, etc., even though what they need may just be restart a hosted service, or view the status of their databases. Another problem is the performance. 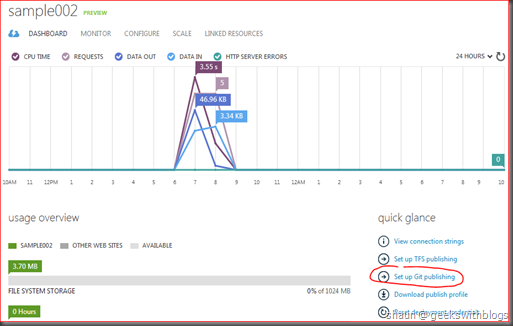 Silverlight provides rich experience to the users, but also needs more bandwidth. Before I started to talk about the new preview portal I’d better highlight that, this preview portal is a PREVIEW version, which means even though you can do almost all features that already in the old one, as long as some cool new features I will mention in the coming several posts, there are something still under developed and migrated. So sometimes you need to switch back to the old one. For example, in preview portal there is no co-admin manage function, no remote desktop function and the SQL database manage function will take you back to the old SQL Azure Manage Portal. 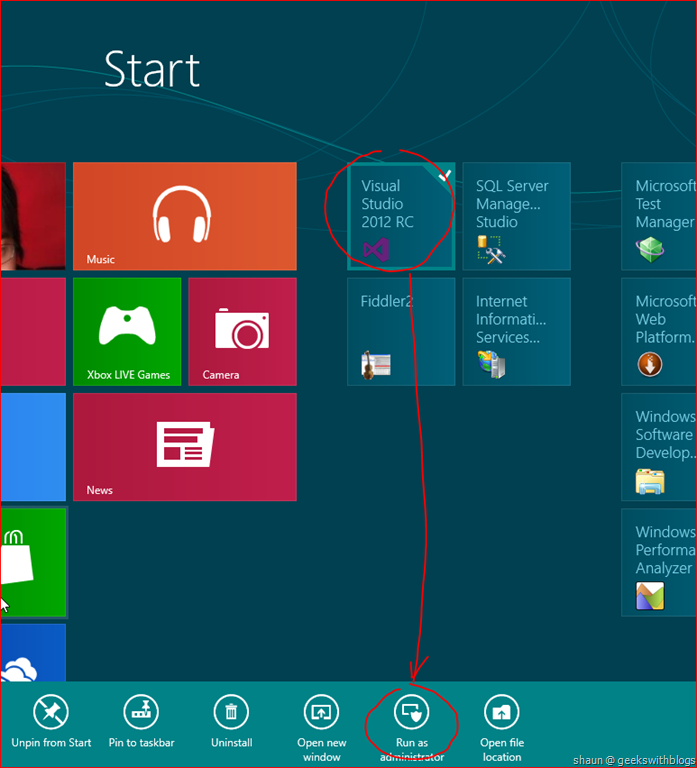 But as Microsoft said these missing features will be moved in the preview portal in the couple of next few months. 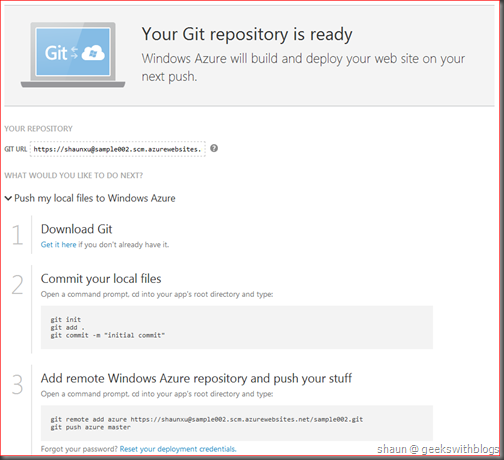 Since the public URL of the developer portal, https://windows.azure.com/, had been changed to point to this preview one, you need to click to preview button on top of the page and click the “Take me to the previous portal” link. There are four parts in the preview portal. On the top is the header which shows the account you are currently logging in. 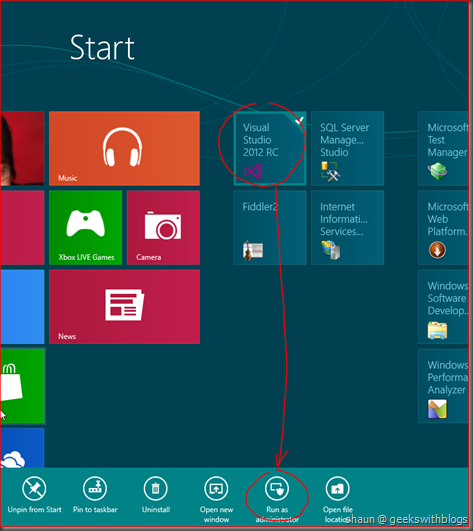 If you click on the header it will show the top menu of windows azure, where you can navigate to the windows azure home page, the price information page, community and account, etc.. The navigation bar is on the left hand side, with the categories listed below. ALL ITEMS All items in your windows azure account, includes the web sites, services, databases, etc.. WEB SITES The web sites in your windows azure account. It will only show the web sites you have. The linked resources will be shown if you drill down into a web site. VIRTUAL MACHINES The virtual machines that you had been deployed to azure. 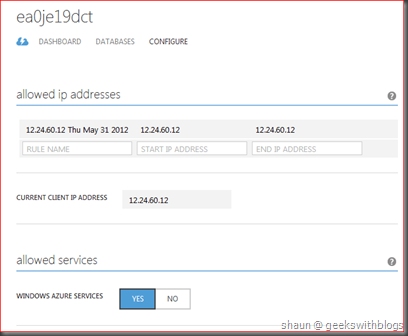 CLOUD SERVICES All windows azure hosted services in your account. 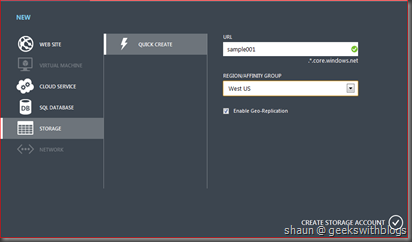 SQL DATABASES All SQL databases (SQL Azure) in your account. 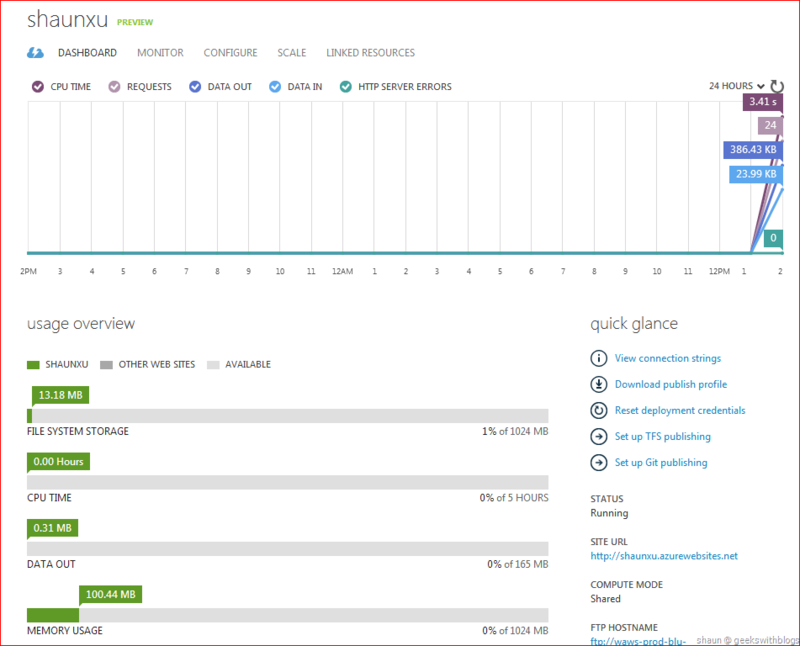 STORAGE All windows azure storage services in your account. NETWORKS The virtual network (Windows Azure Connect) you had been created. The available items will be listed in the main part of the page based on which category your currently selected. If there’s no item it will show the link to you to quick create. At the bottom of the page there will be the command and information bar. Based on what is selected and what is performed by the user, it will show the related information and commands. For example, in the image below when I was creating a new web site, the information bar told me that my web site is being provisioned; and there are two commands in the command bar. And once it ready the command bar will show some commands that I can do to my new web site. The “Web Sites” is a new feature introduced alone with this upgrade. It gives us an easier and quicker way to establish a website from the scratch or from some existing library. I will introduce it more details in the coming next post. Also in the command bar you can create a service by clicking the NEW button. It will slide the creation panel up to you. 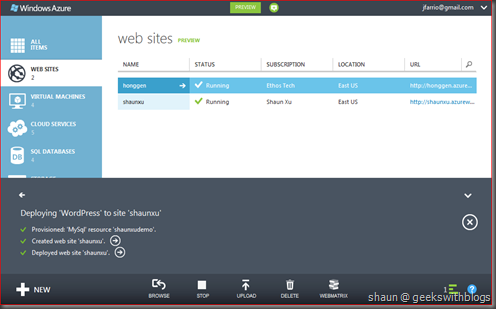 The Windows Azure Hosted Services had been renamed to the Cloud Services. Create a new service would be very easy. 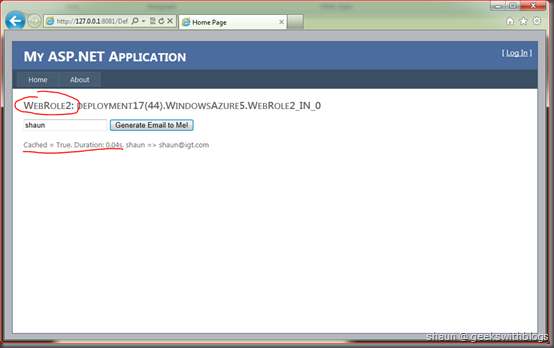 Just click the NEW button at the bottom of the page, and select the CLOUD SERVICE and QIUICK CREATE. This will create a blank hosted service without deployment and certificate. It just needs you to specify the service URL and the affinity/region. Then the service will be shown in the list. If you clicked the item all information will be shown in the main part. Since there’s no package deployed to this service so currently we cannot see any information about it. But we can upload the package by using the command at the bottom. And as you can see, we could manage the configuration, instances, certificates and we can scale up and down (change the VM size), in and out (increase and decrease the instance count) to our service. 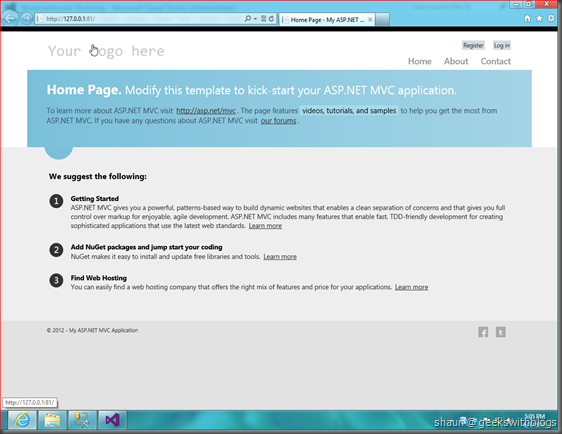 Assuming I had created an ASP.NET MVC 3 web role project in Visual Studio and completed the package. Then I can click the UPLOAD button in this page to deploy my package. 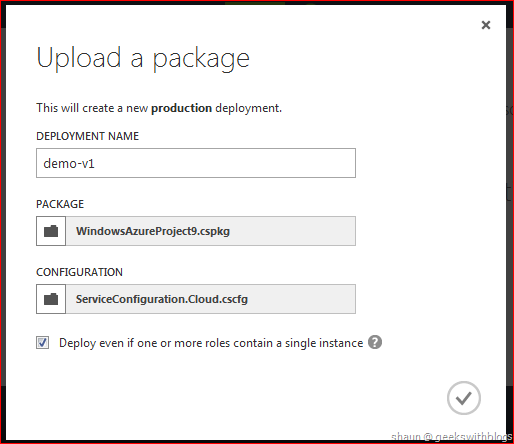 In the popping up window I just specify my deployment name, package file and configure file. Also I can check the box below so that it will NOT warn me if only one instance of this deployment. Once we clicked the OK button our package will be uploaded and provisioned by the platform. After a while we can see the service was ready from the information bar. We can have the basic information about this service and deployment if we to the dashboard page. 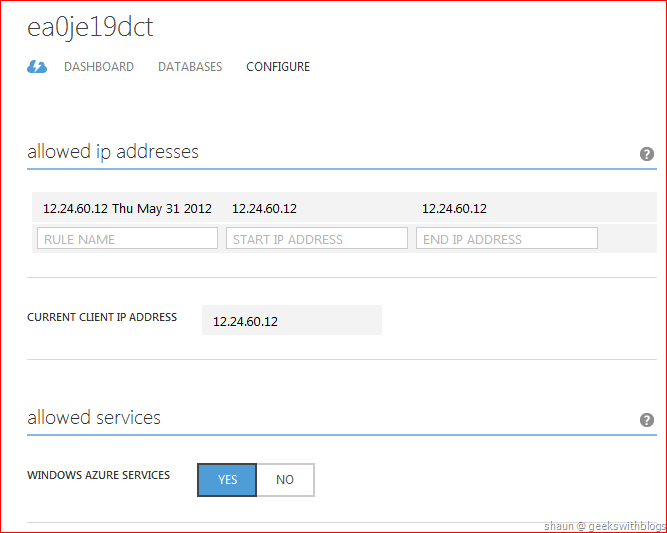 For example the usage overview diagram, status, URL, public IP address, etc.. 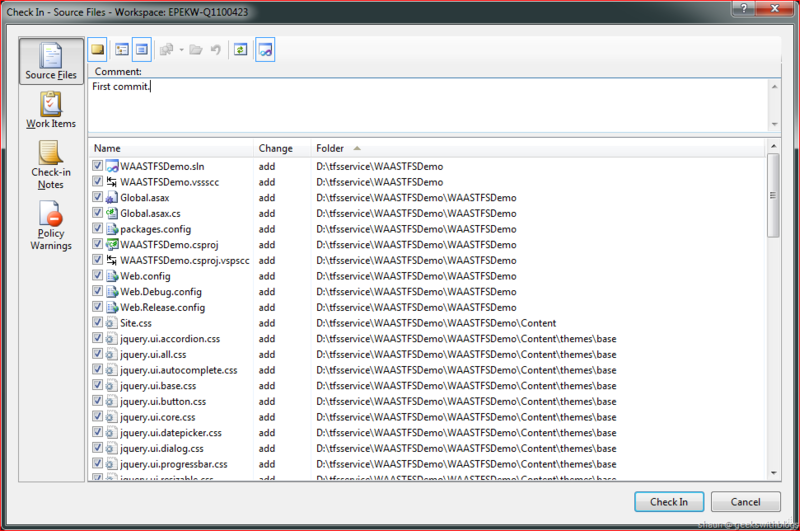 In the configure page we can view and change the CSCFG content such as the monitor setting, connection strings, OS family. In scale page we can increase and decrease the count of the instances. And in the instances page we can view all instances status. And, if your services is using some SQL databases and storages they will be shown as the linked resources under the linked resources page. And you can manage the certificates of this service as well under the certificates page. The storage service can be managed by clicking into the STORAGES link in the navigation bar. And we can create a new storage service from the NEW button. After specify the storage name and region it will be previsioned by the platform. If you want to copy or manage the storage key you can just click the Manage Keys button at the bottom, which is very easy. 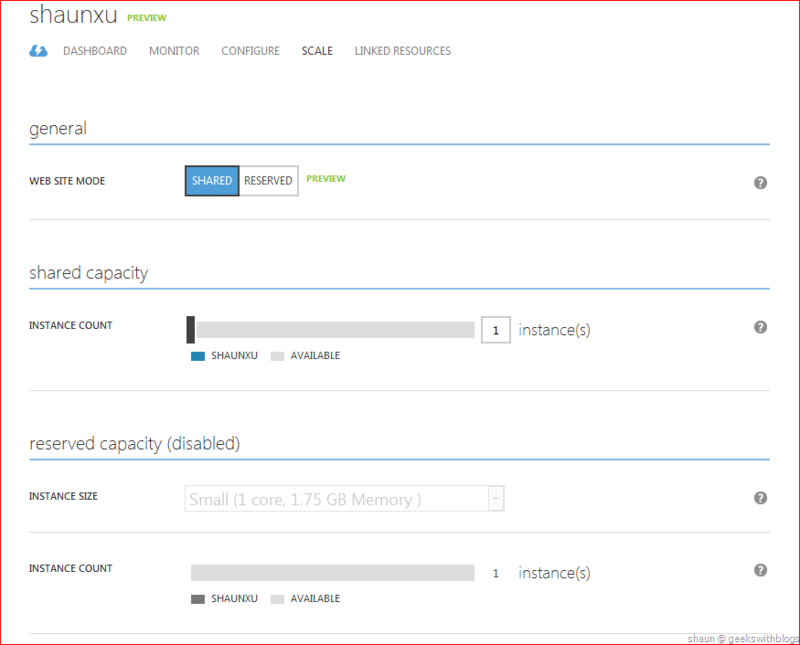 What I want to highlight here is that, you can monitor your storage service by enabling the monitor configuration. 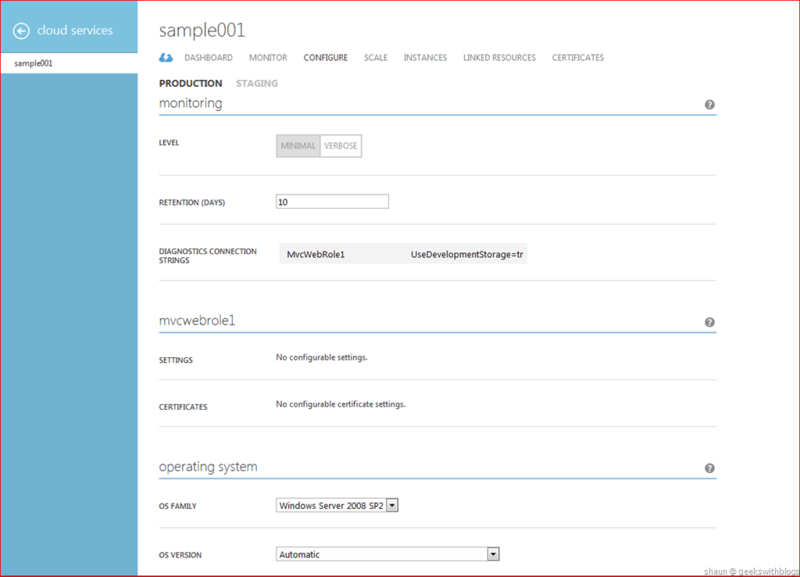 Click the storage item in the list and navigate to the configure page. 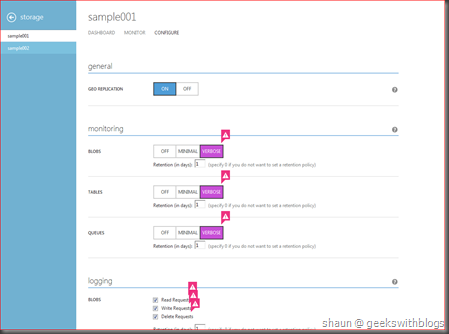 As you can see in the page you can enable the monitoring for blob, table and queue. And you can also enable the logging when any requests come to the storage. 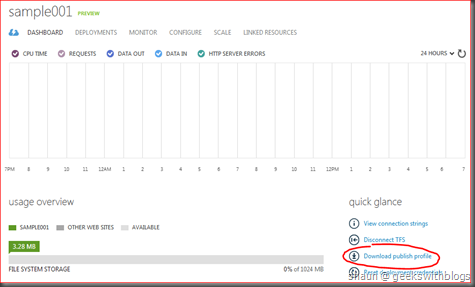 But as the tooltip shown in the page, enabling the monitoring and logging will increase the usage of the storage, which means increase the bill of them. So make sure you enable them properly. 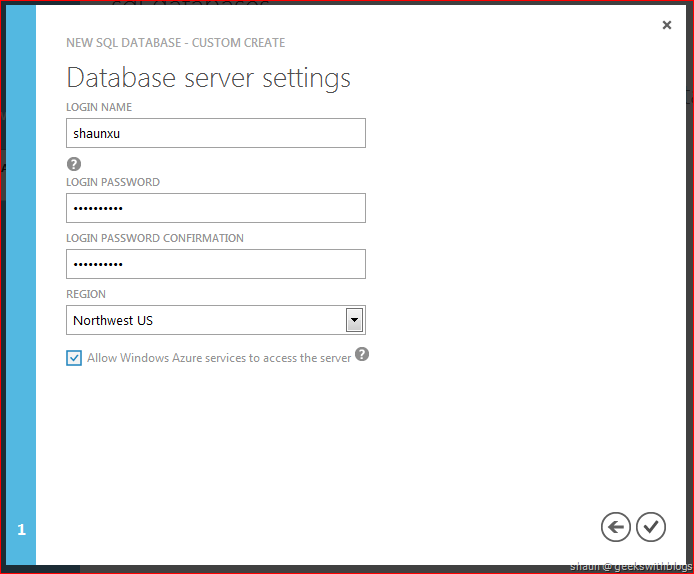 The last thing I want to quick introduce is the SQL databases, which was formally named SQL Azure. 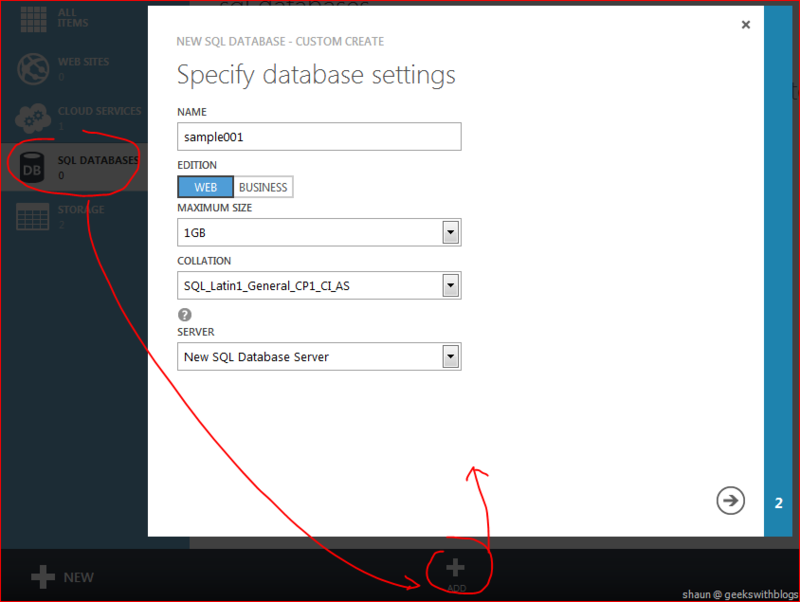 You can create a new SQL Database Server and a new database by clicking the ADD button under the SQL Database navigation item. 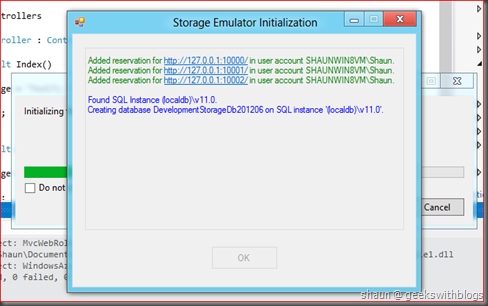 In the popping up windows just specify the database name, the edition, size, collation and the server. 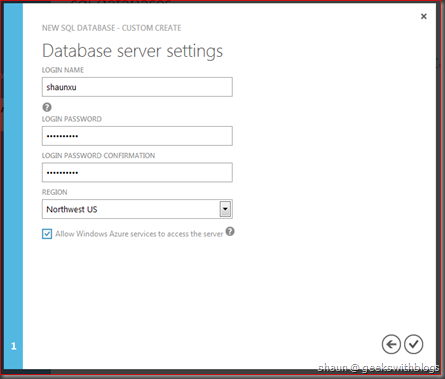 You can select an existing SQL Database Server if you have, or cerate a new one. If you selected to create a new server, there will be another step you need to do, which is specify the server login, password and the region. Once it ready you can mange your databases as well as the servers in the portal. In a particular server you can update the firewall settings in its Configure page. There are some other area on the preview portal I didn’t cover, such as the virtual machines, virtual network and web sites. 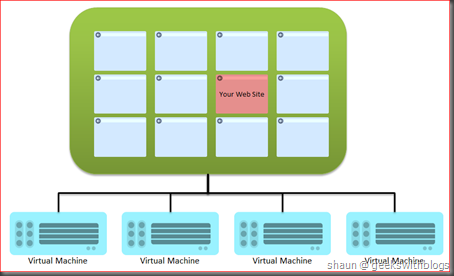 Regarding the virtual machines and web sites I will talk about them in the future separated post. 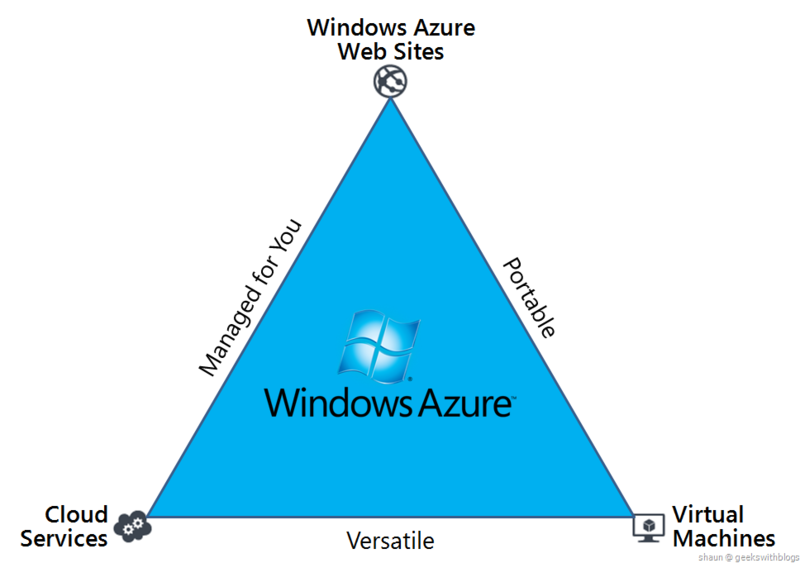 Regarding the virtual network, it the Windows Azure Connect we are familiar with. But as I mention in the beginning of this post, the preview portal is still under developed. Some features are not available here. 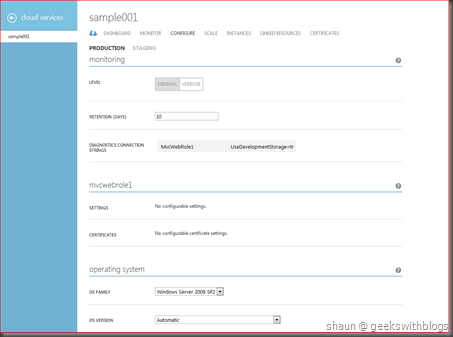 For example, you cannot manage the co-admin of your subscriptions, you cannot open the remote desktop on your hosted services, and you cannot navigate to the Windows Azure Service Bus, Access Control and Caching, which formally named Windows Azure AppFabric directly. In these cases you need to navigate back to the old portal. So in the coming several months we might need to use both these two sites. 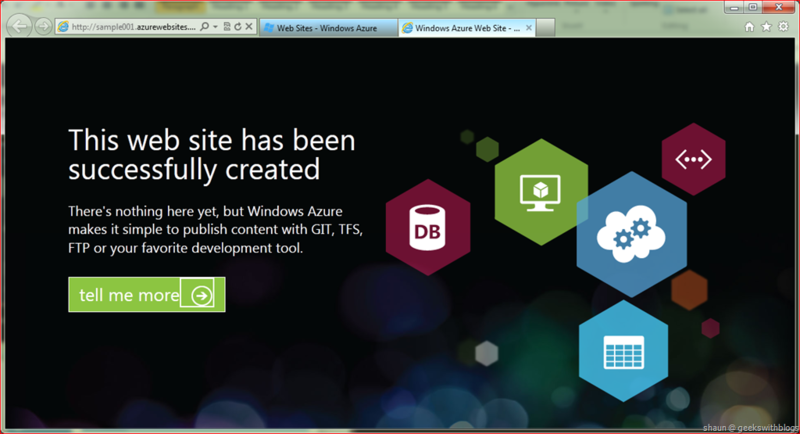 In this post I quick introduced the new windows azure developer portal. 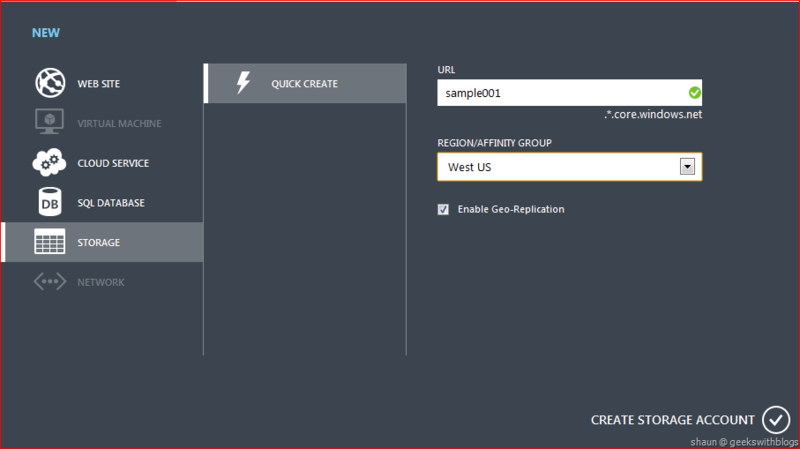 Since it had been rearranged and renamed I demonstrated some features that existing in the old portal, such as how to create and deploy a hosted service, how to provision a storage service and SQL database. All features in the old portal had been, is being and will be migrated into this new portal, but some of them were in a different category and page we need to figure out.